Among other components in the packaging of a record is the inner sleeve. 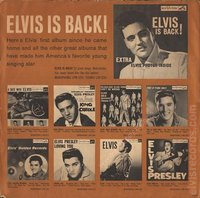 The purpose of the inner sleeve was to originally protect the record from the elements. 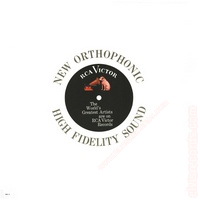 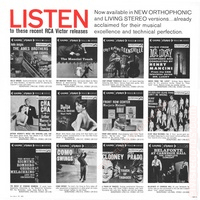 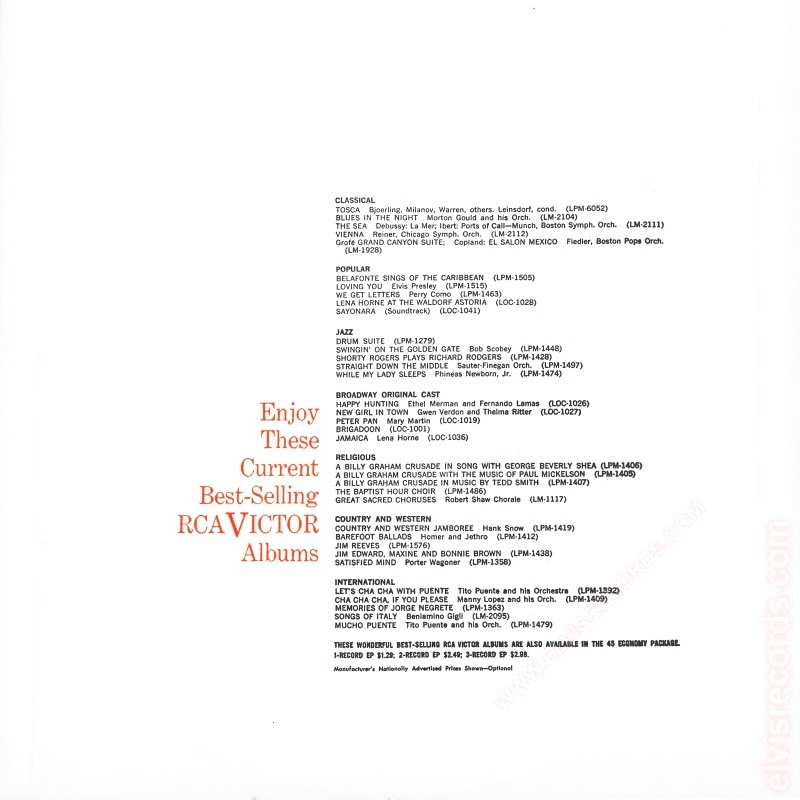 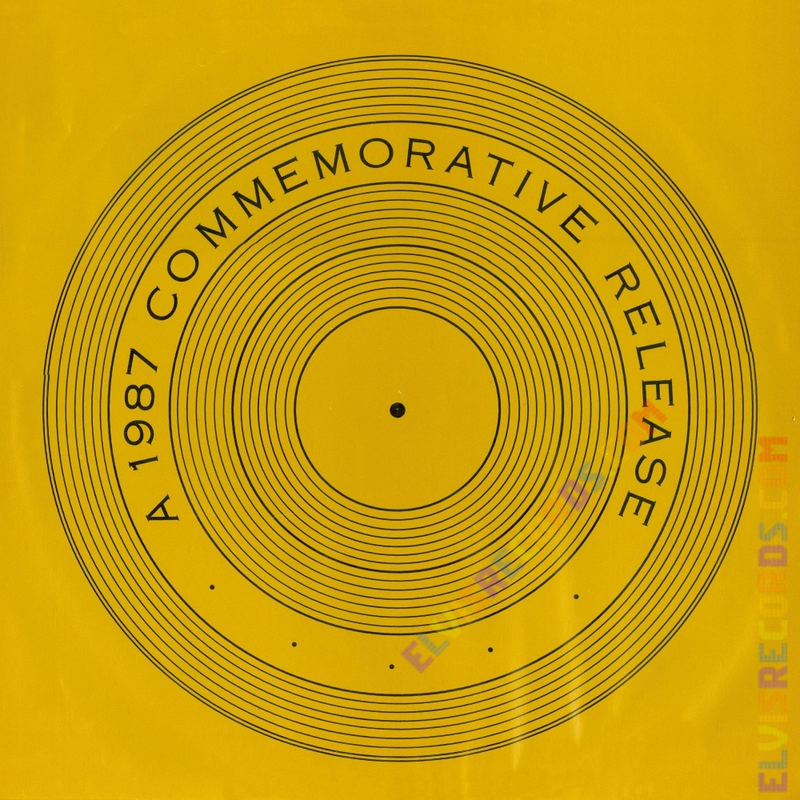 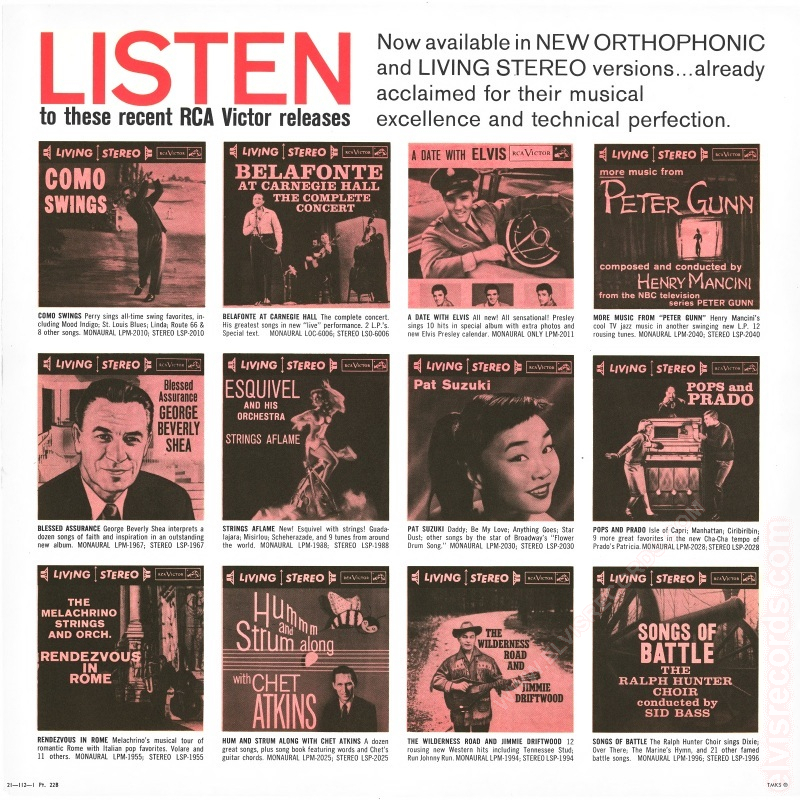 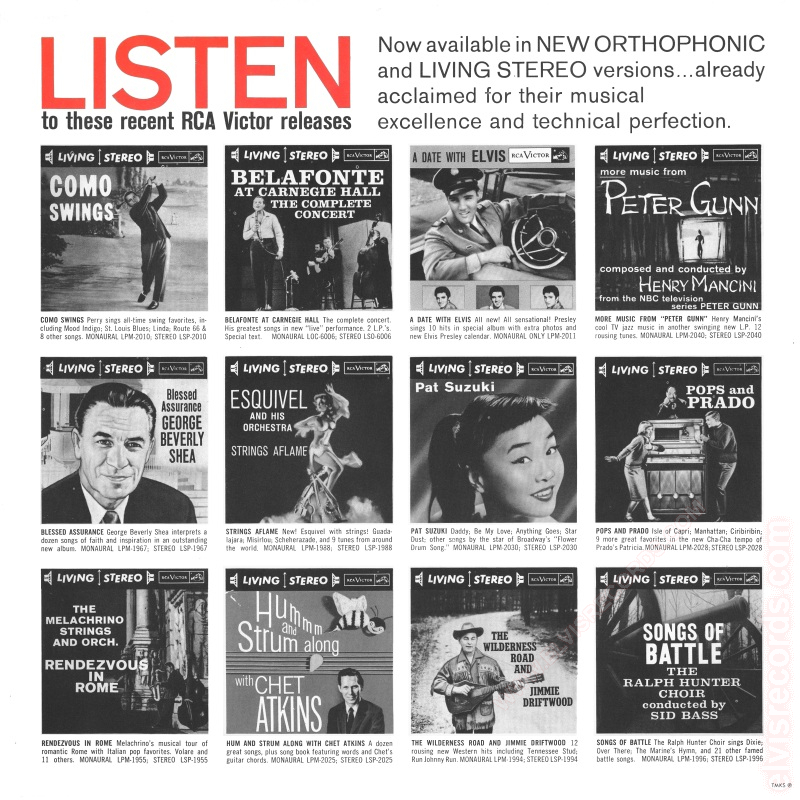 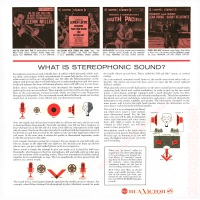 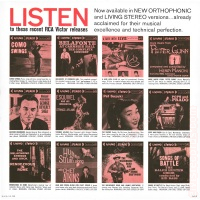 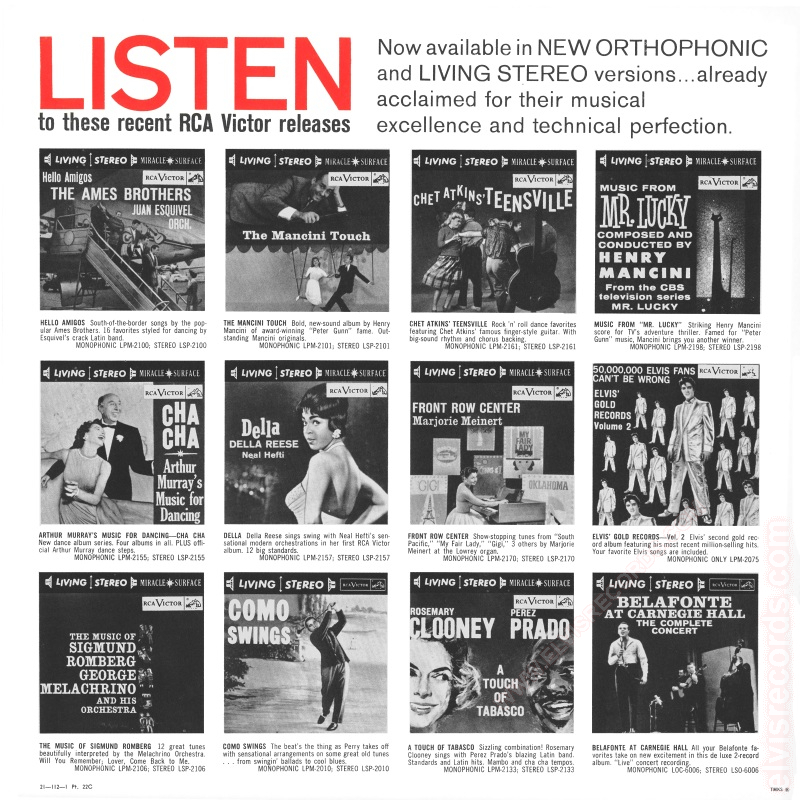 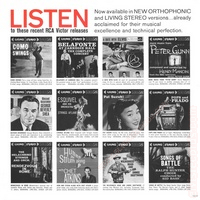 The inner sleeve evolved into an effective marketing tool by introducing the buyer to other formats and other releases from the RCA Victor catalog. 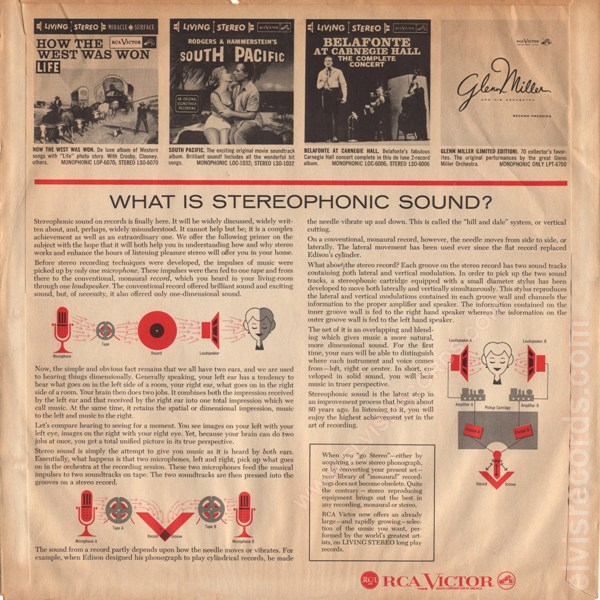 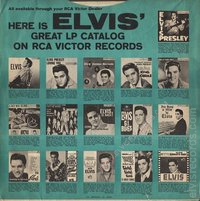 Early Elvis Presley releases on the RCA Victor record label were packaged with either a generic paper inner sleeve featuring the RCA Victor logo or rice paper, as seen with some copies of LPM-1254. 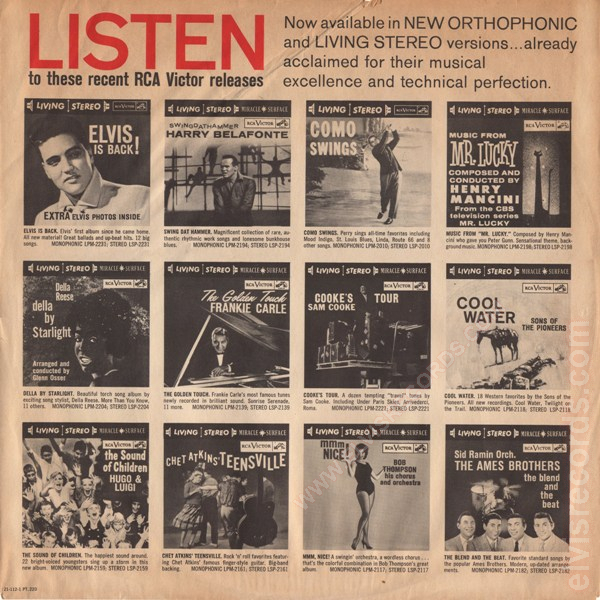 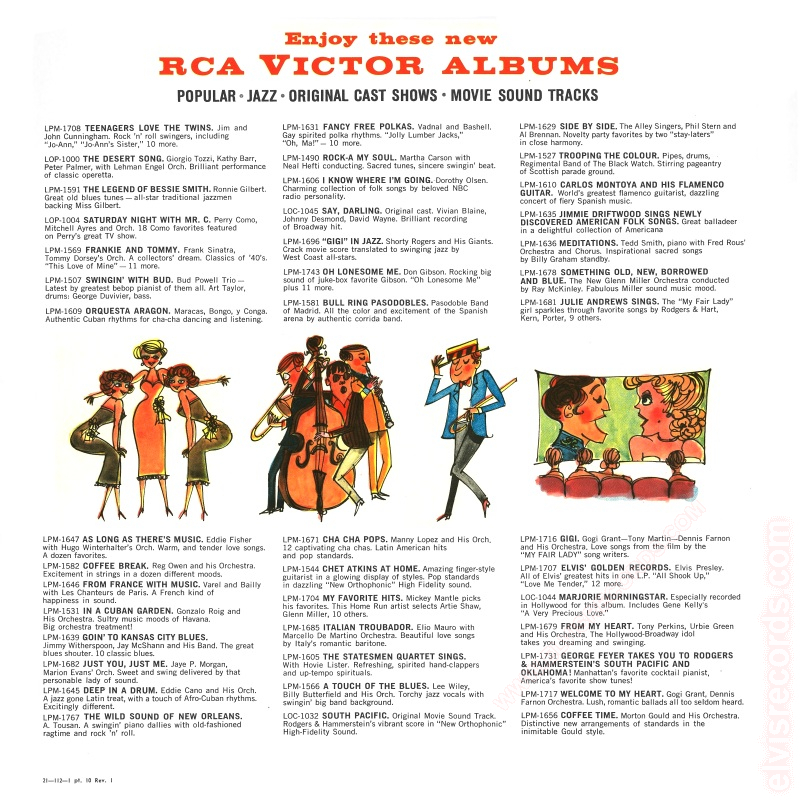 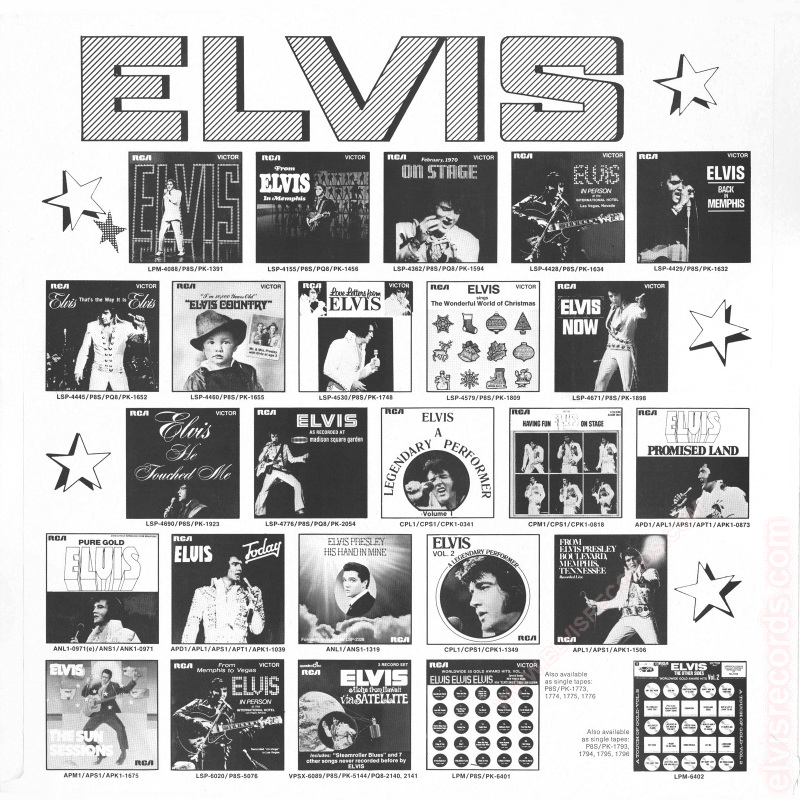 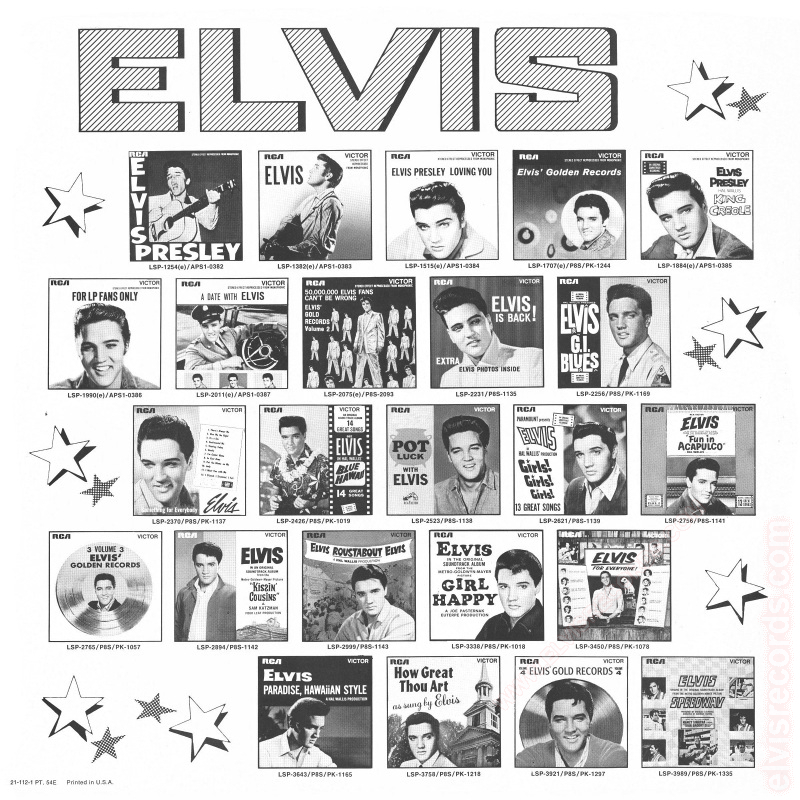 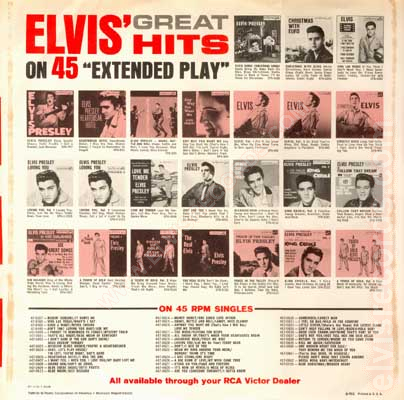 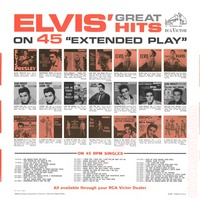 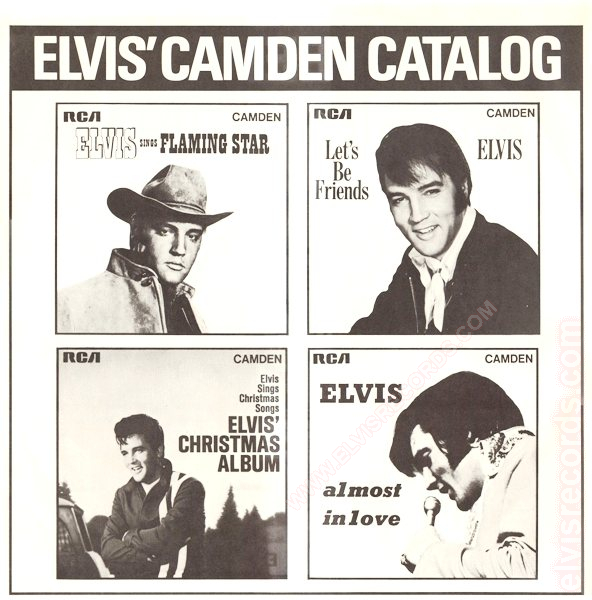 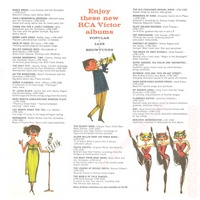 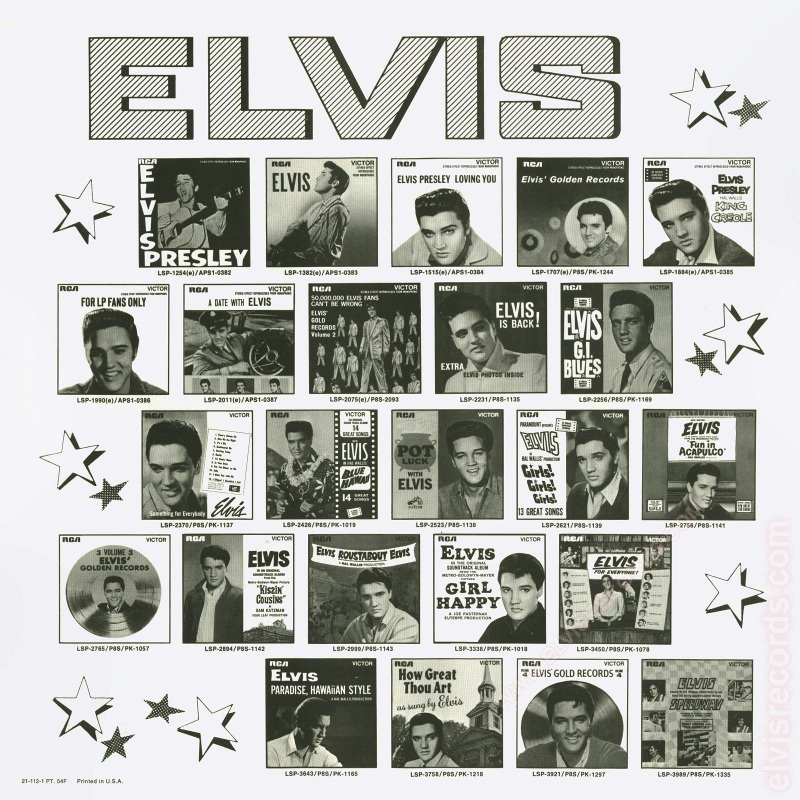 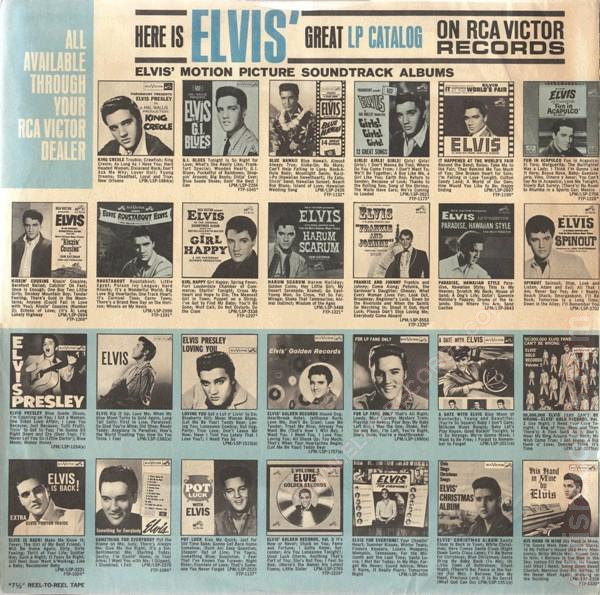 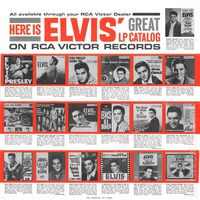 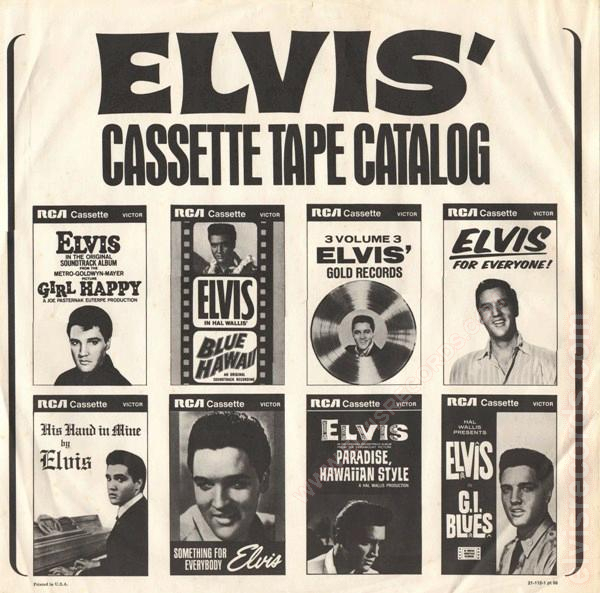 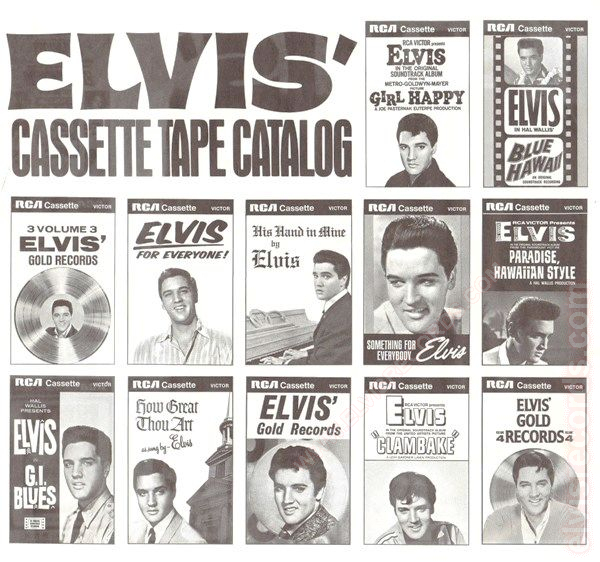 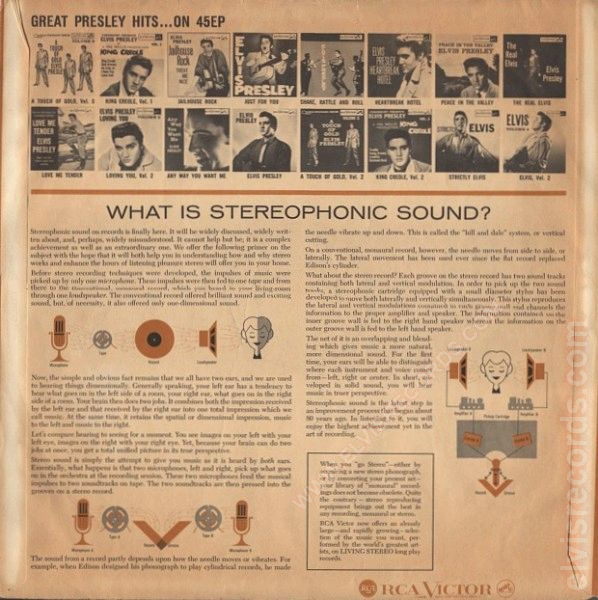 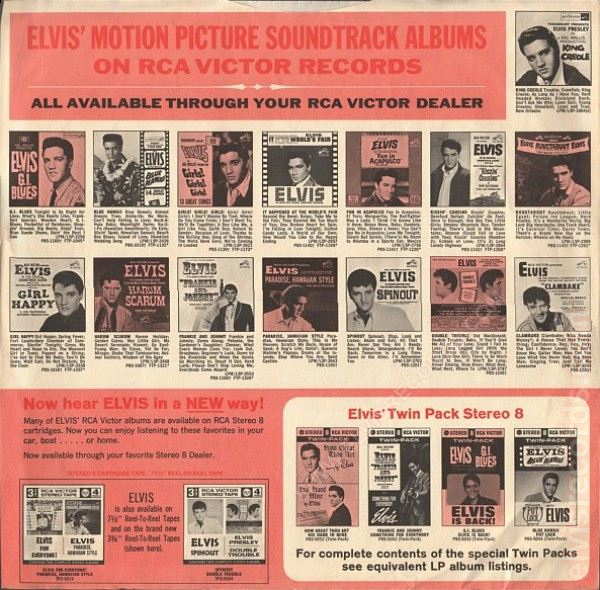 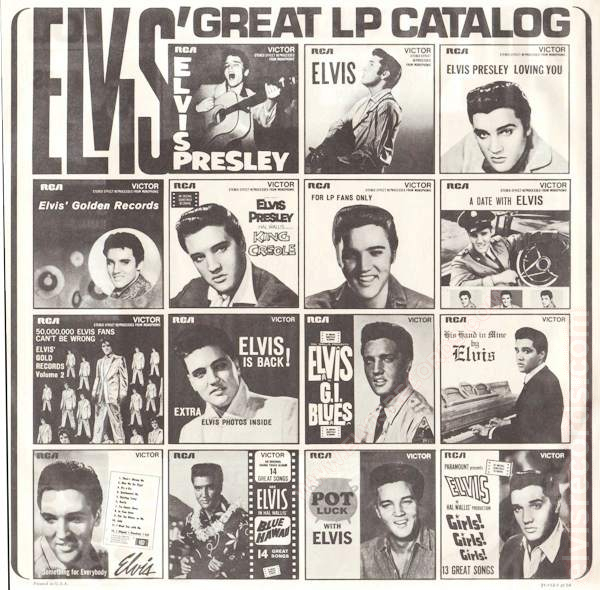 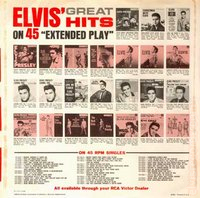 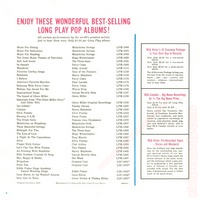 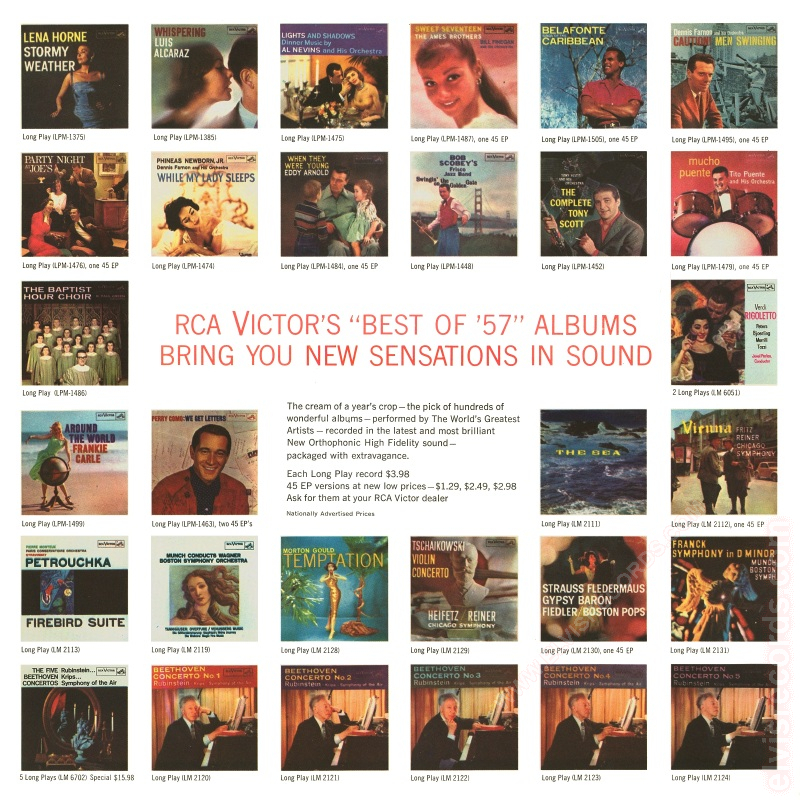 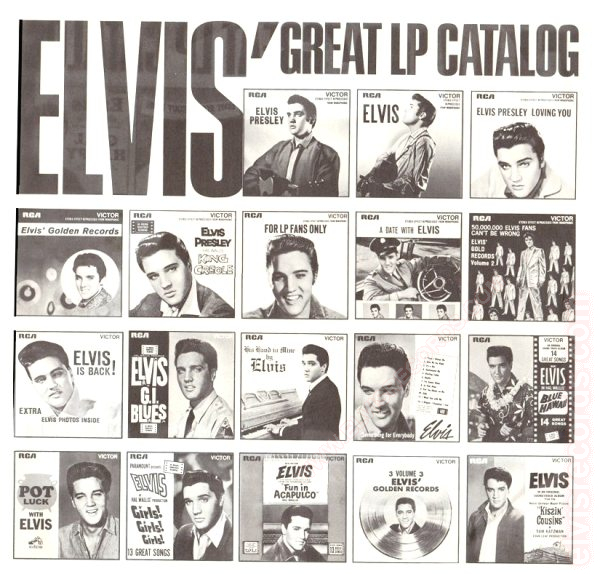 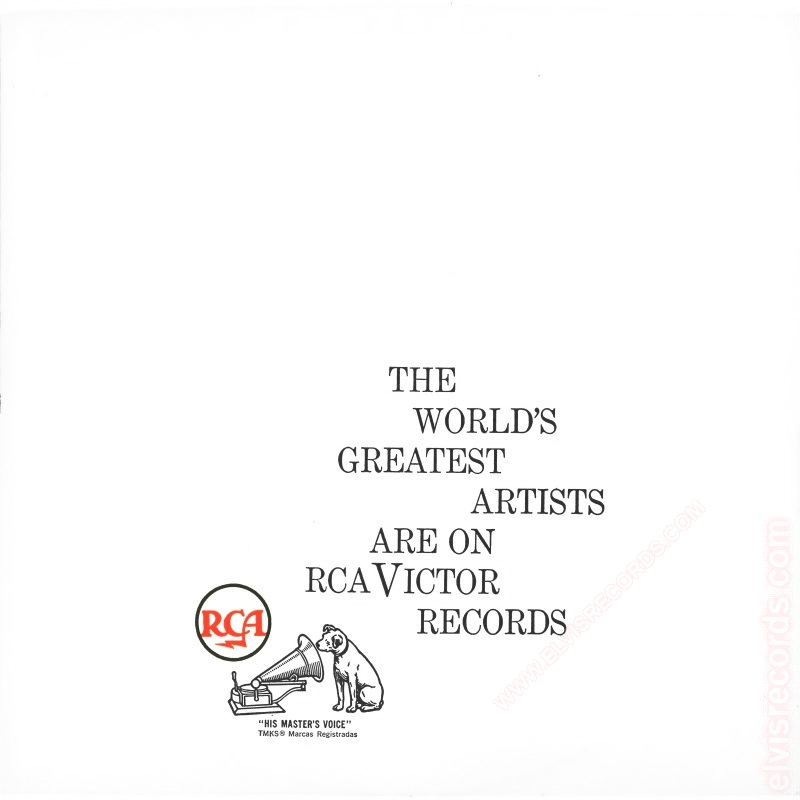 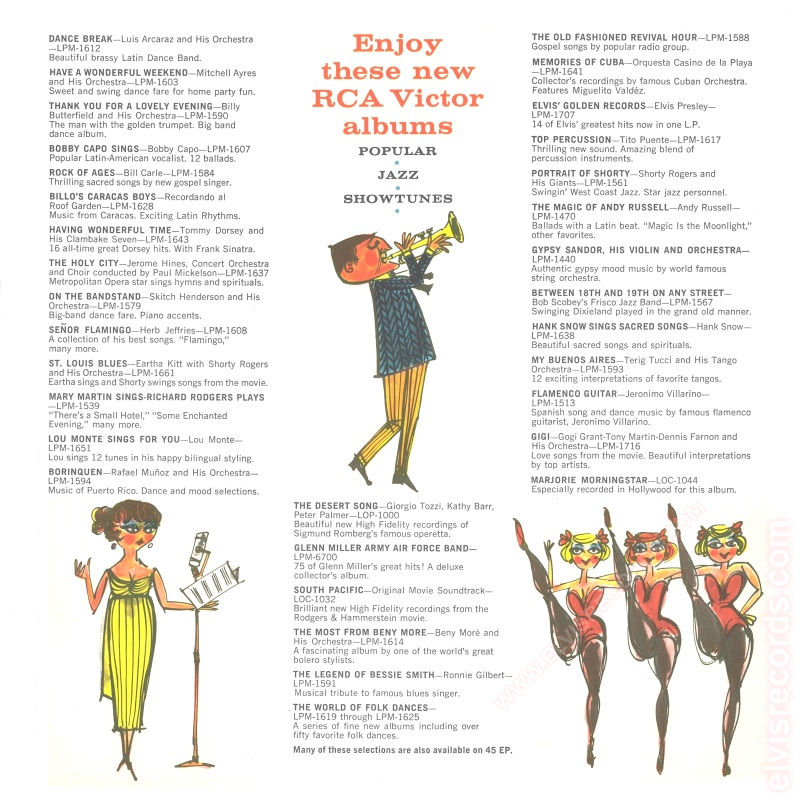 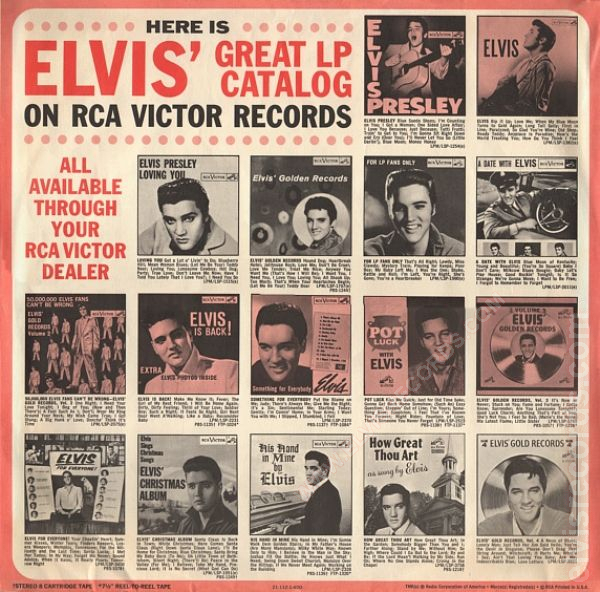 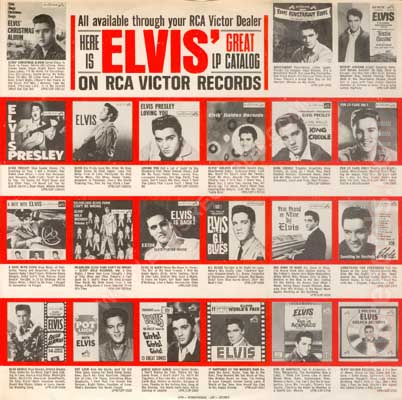 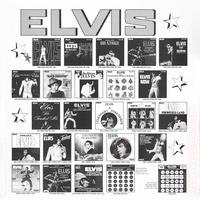 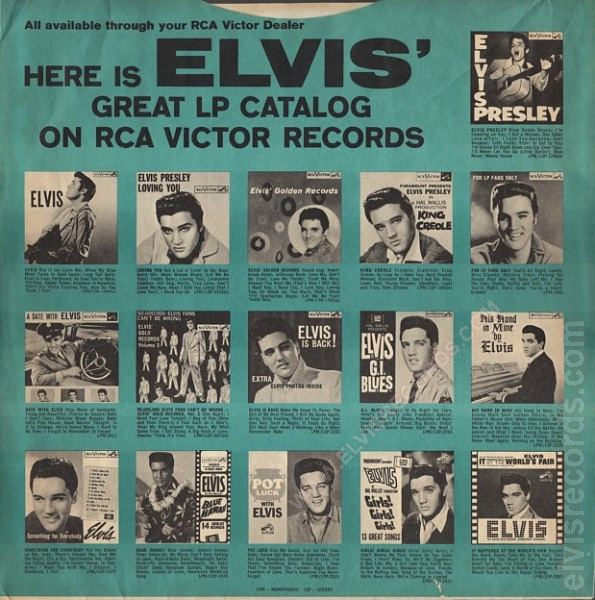 In the late 1950's, inner sleeve depicted other releases from the RCA Victor catalog of various artists including a few from the Elvis Presley catalog. 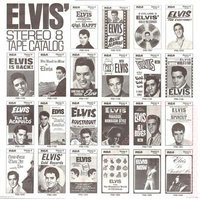 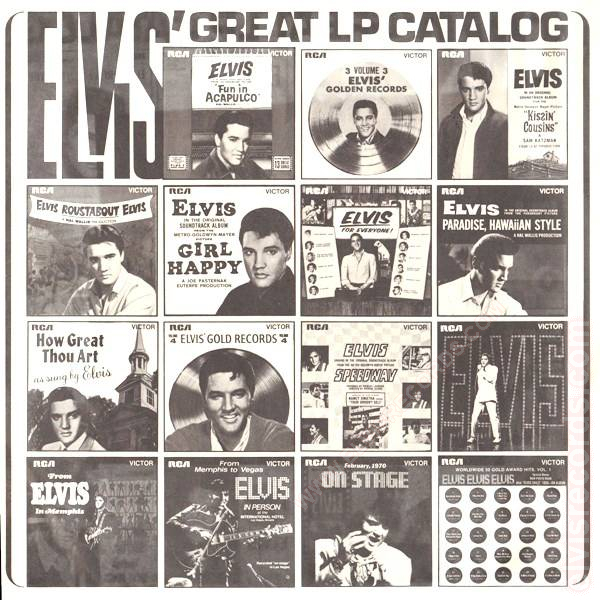 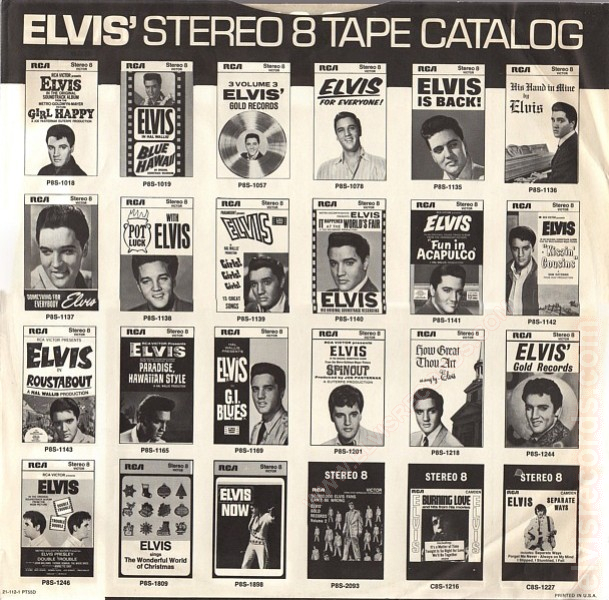 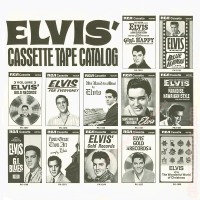 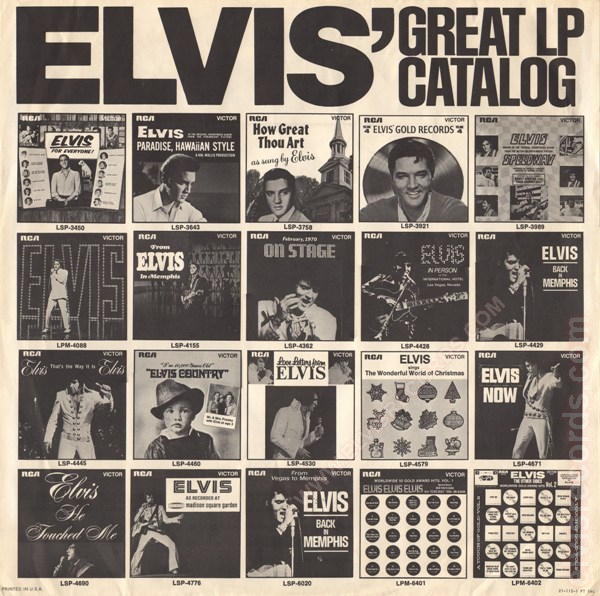 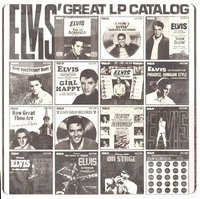 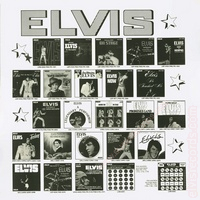 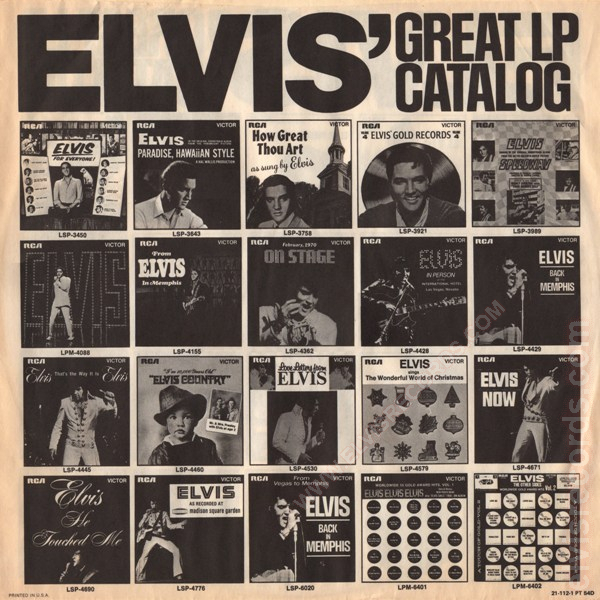 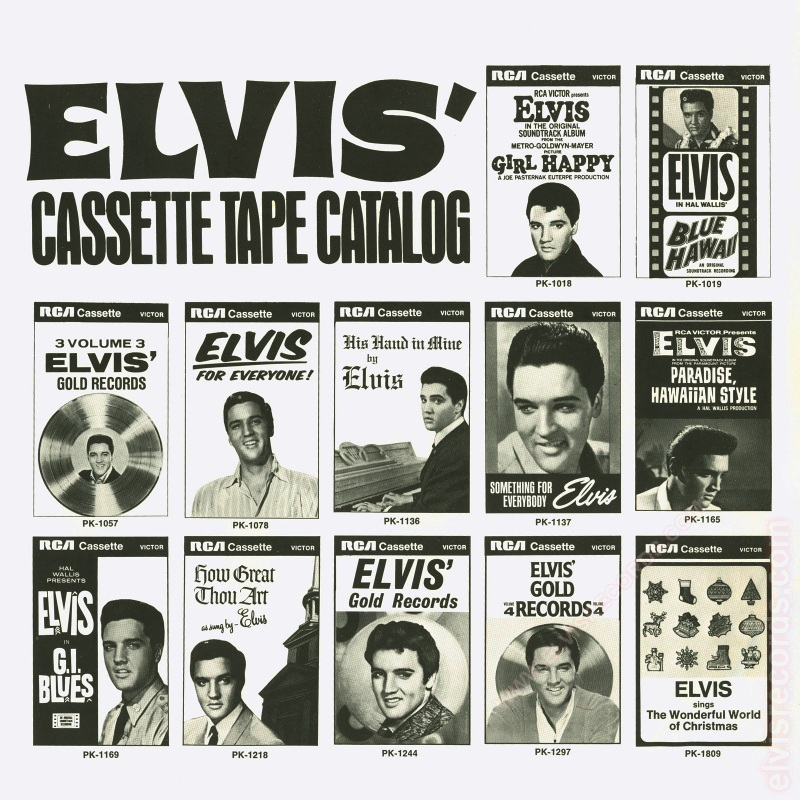 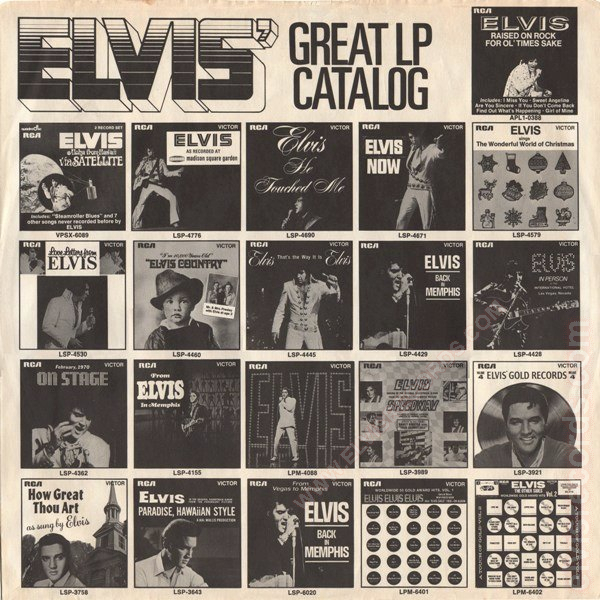 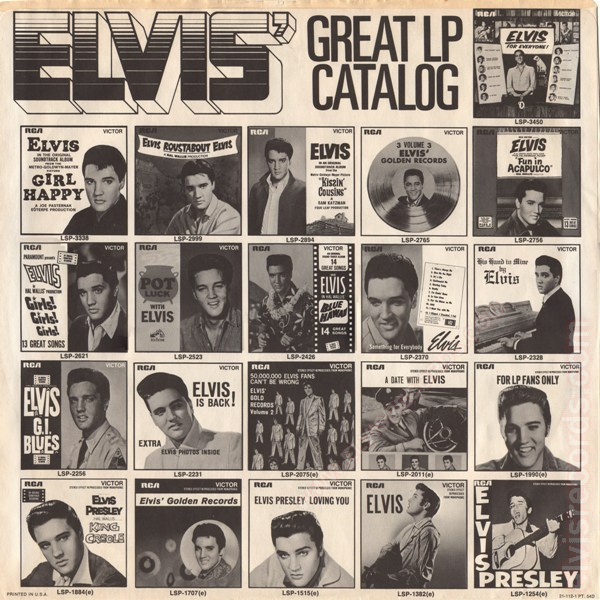 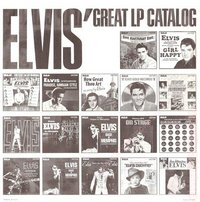 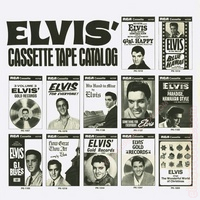 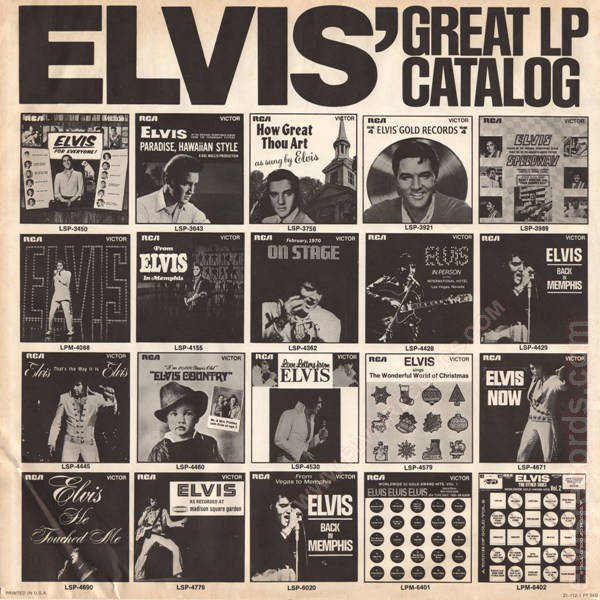 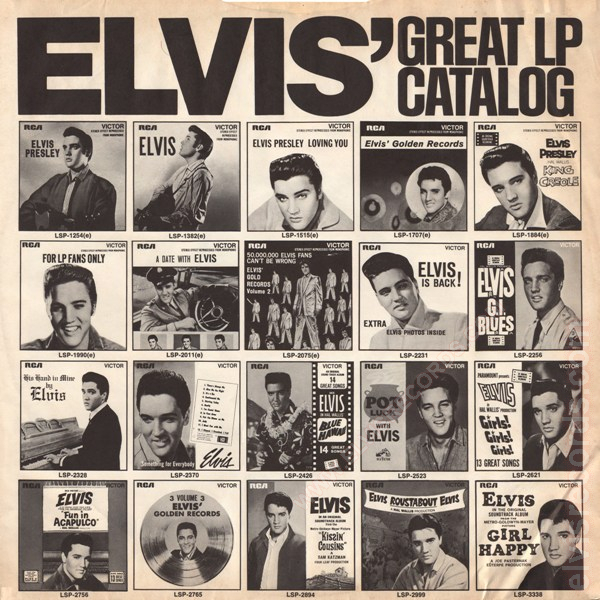 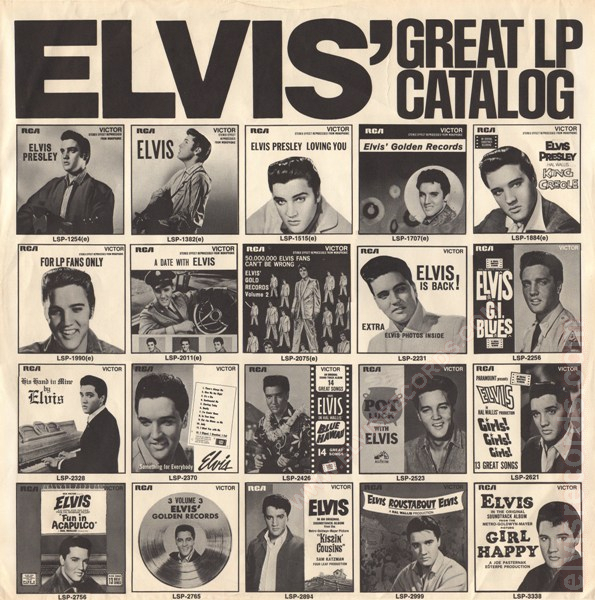 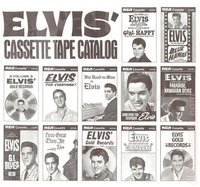 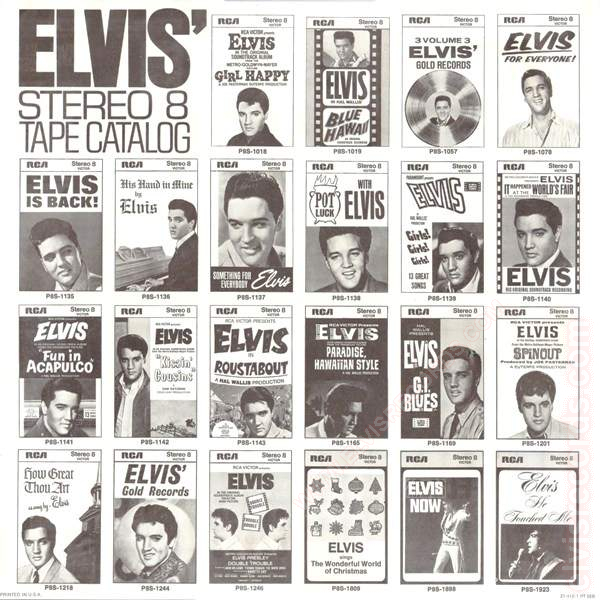 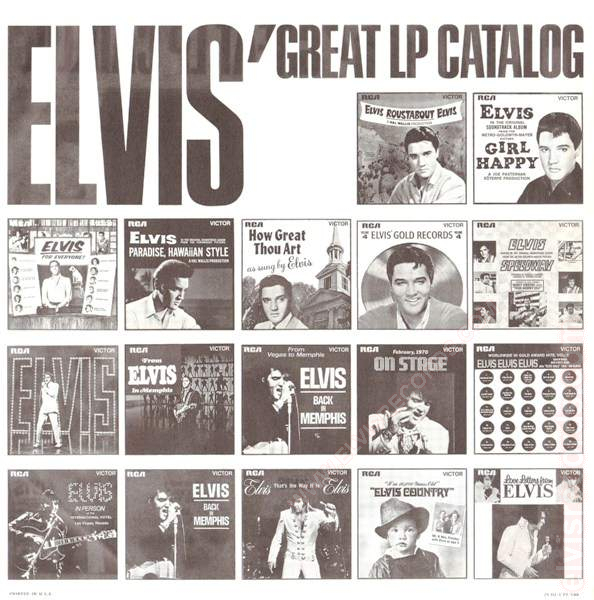 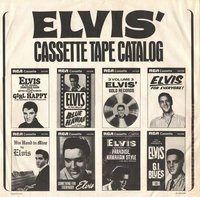 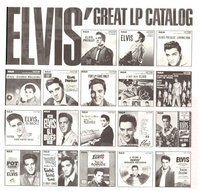 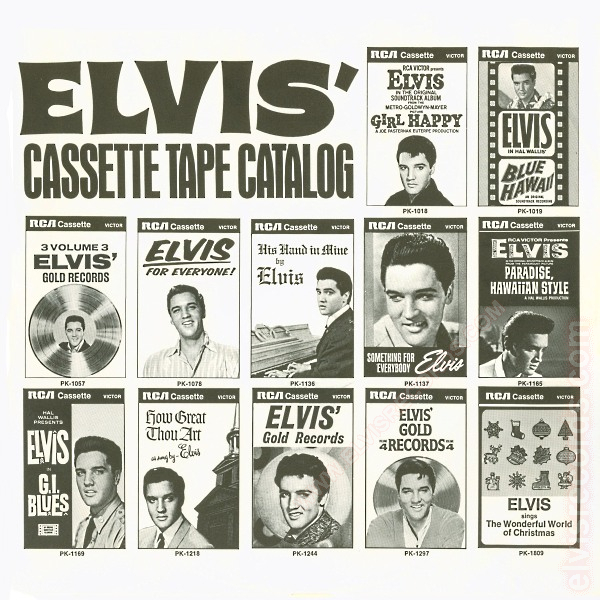 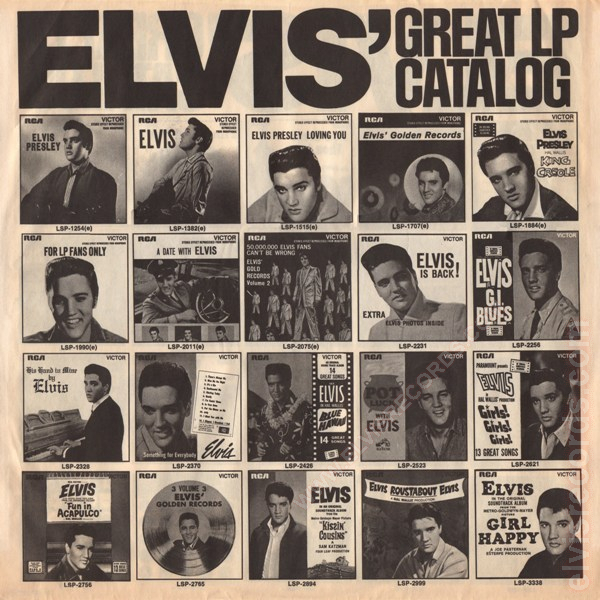 By 1959, Elvis records were packaged with inner sleeves featuring only the Elvis Presley catalog. 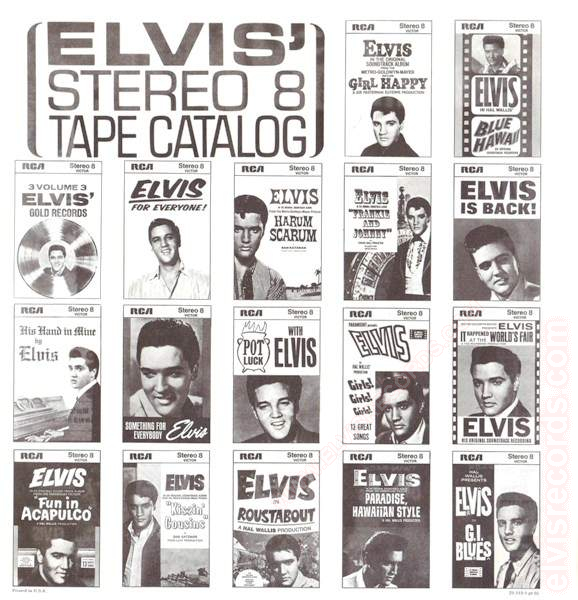 This marketing strategy would continue for the rest of Elvis' career. 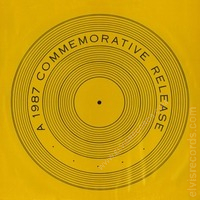 To match the "correct" inner sleeve for a particular release is not an exact science. 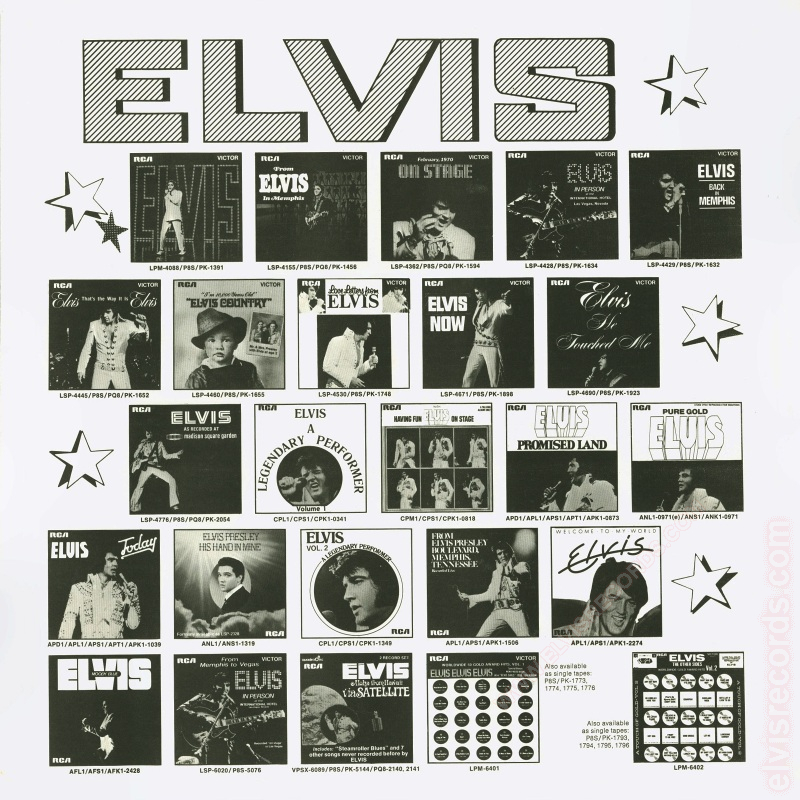 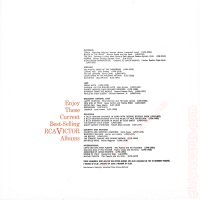 Generally the inner sleeve corresponds to the year the record was produced. 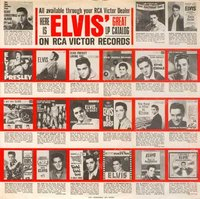 For example, if a record was released in late 1963, the inner sleeve of that year would likely be the sleeve associated with that record release; however, earlier sleeves may be found packaged with this release as RCA exhausted their existing supply of sleeves. 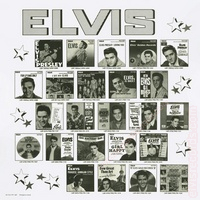 In other cases, later sleeves may be found as the record was re-released over a period of years. 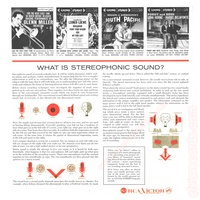 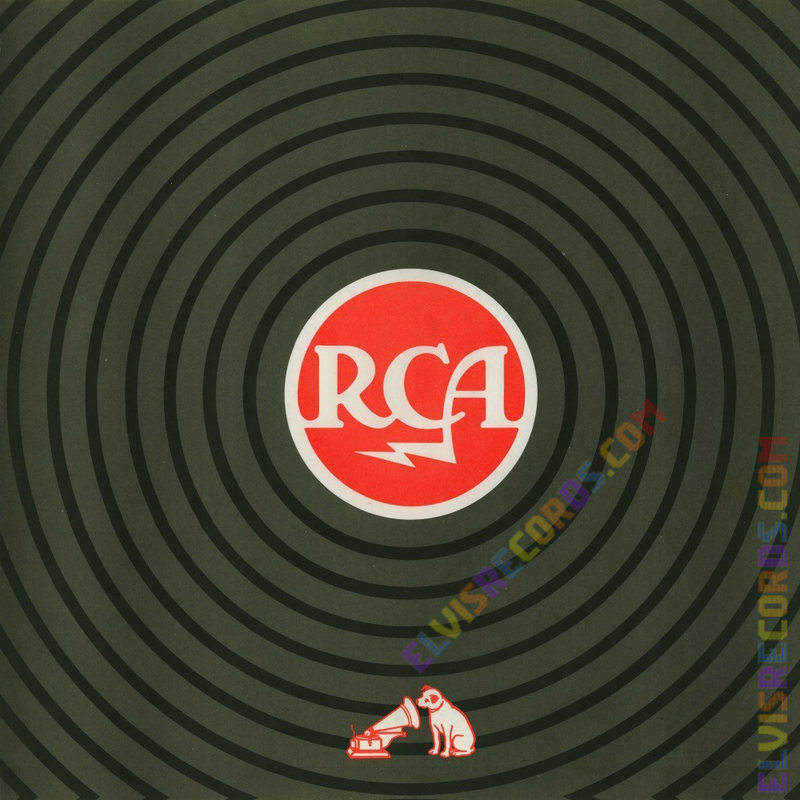 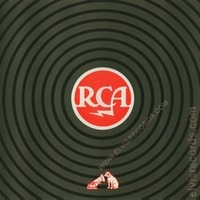 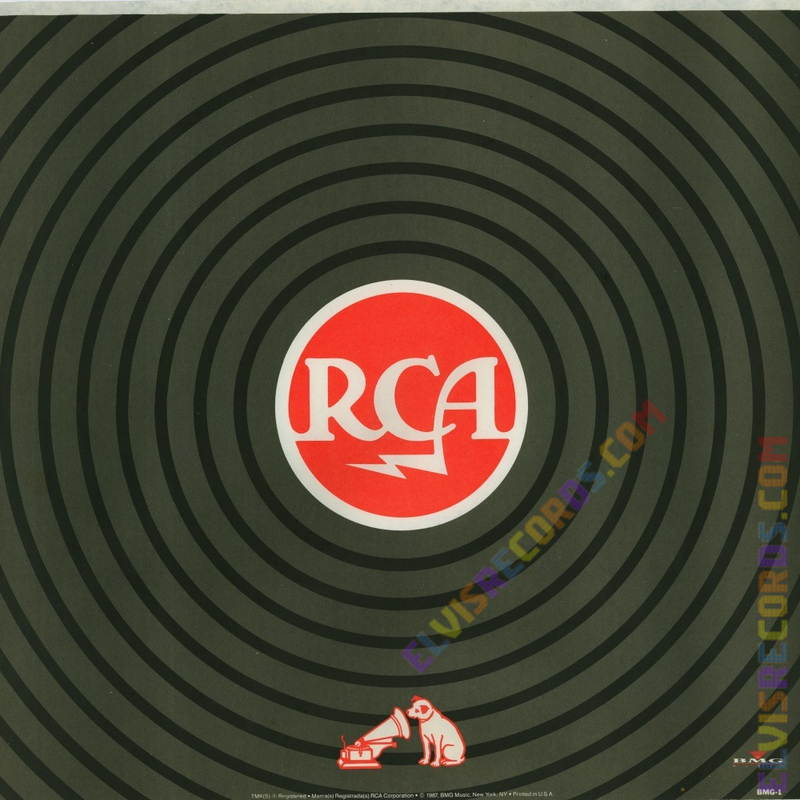 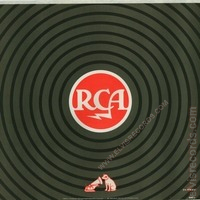 In some cases, a generic RCA sleeve may have been used. 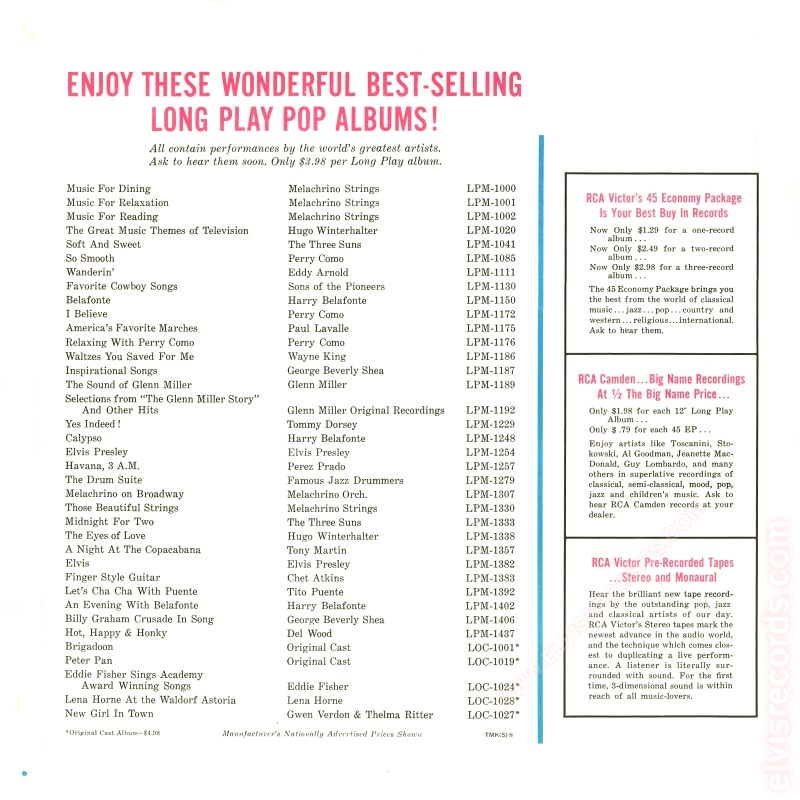 Some interim releases had only white sleeves. 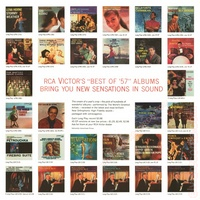 Some RCA Camden releases were not packaged with inner sleeves. 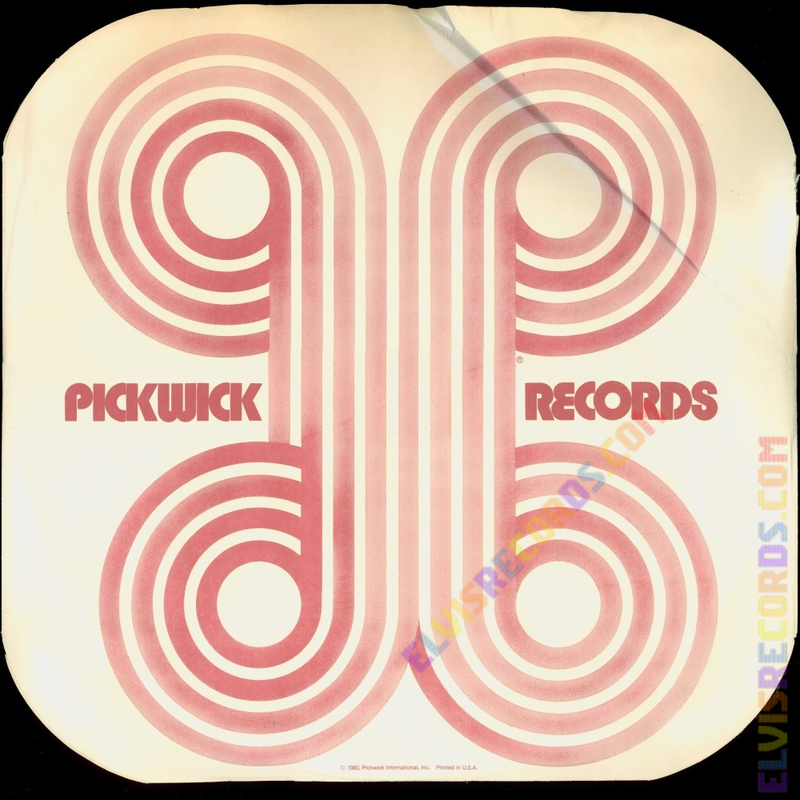 This gallery exists to assist in the identification of the inner sleeve that is most appropriate to a release. 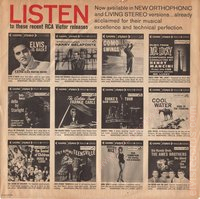 Number on sleeve: n/a (1957) Full color sleeve, picturing 30 of RCA Victor's "Best of '57" Albums Bring You New Sensations in Sound on one side and listing "Elvis Presley" and "Elvis" LP's in the Best-Selling Long Play Pop LP line on the other side. 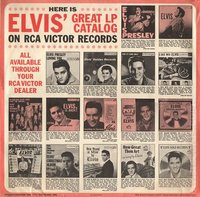 Number on sleeve: n/a (1958) Black, white, and red sleeve, pictures no records, but lists 35 "Current Best Selling RCA Victor Albums" including Loving You listed second in the Popular Category. 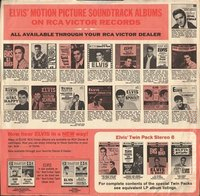 Number on sleeve: n/a (1958) 1 Black, white, and red sleeve, pictures no records, but lists "Elvis Golden Records" LP as one of 33 LP's in the "New RCA Victor Albums" line. 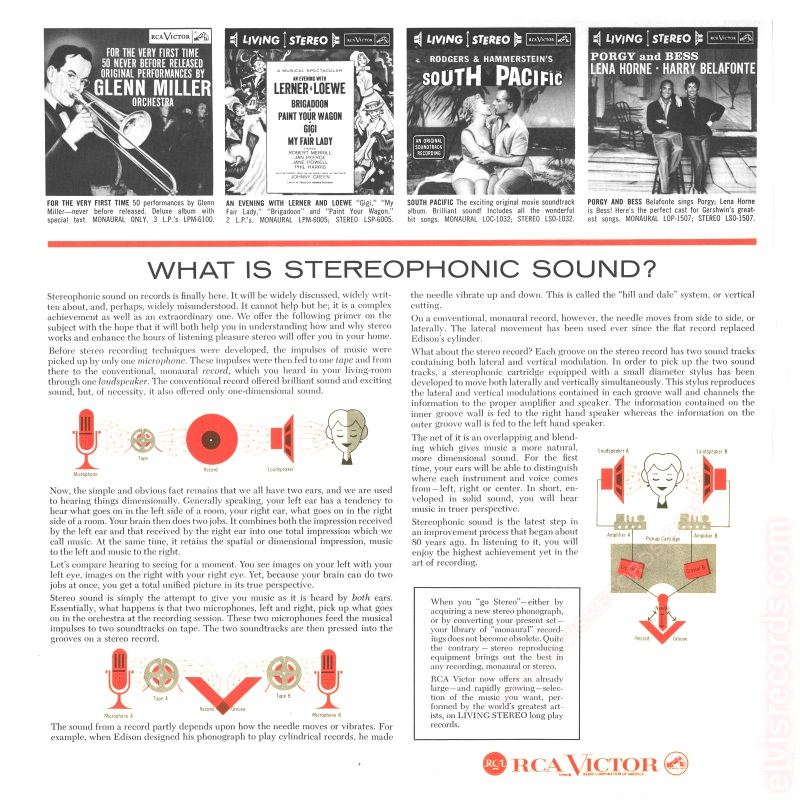 (Side 2, Row 3, Column 3) Note: Not listed in any other guide. 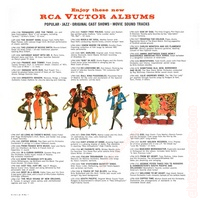 Note: An example of this sleeve was taken from RCA Victor LPM-2044 Christmas Joy by George Melachrino and His Orchestra (LP). 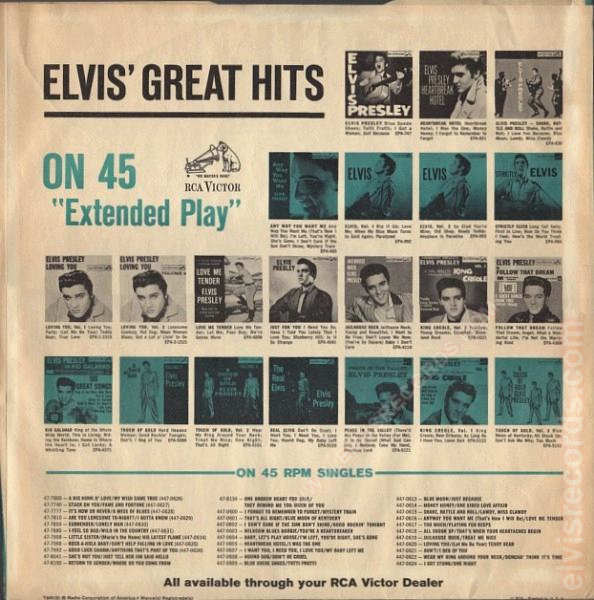 On the back side of this inner sleeve lists the "Great Presley Hits ... On 45EP". Two pictures are transposed with their title. Just For you and Elvis Presley are mislabled. 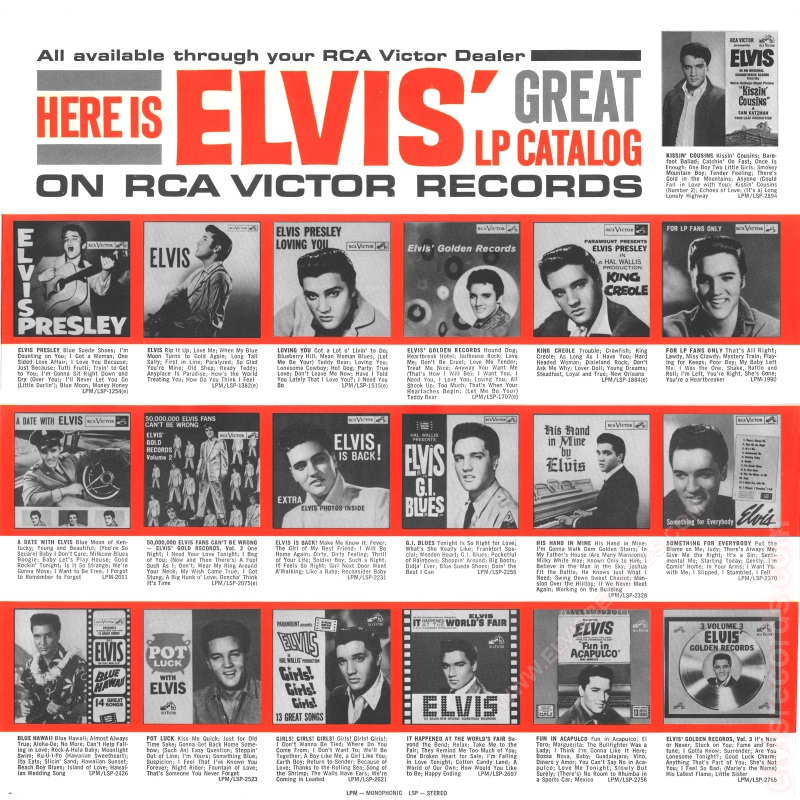 The Jailhouse Rock EP is incorrectly identified with the RCA Victor 47-7035 Jailhouse Rock / Treat Me Nice. 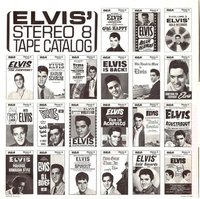 Number on sleeve: n/a (9/1963) Black, white, and turquoise sleeve. 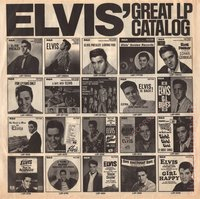 Front pictures Elvis LP catalog, most recent of which is "It happened at the Worlds Fair" (Side 1, Row 1) Back shows RCA Elvis EP & 45 catalog. 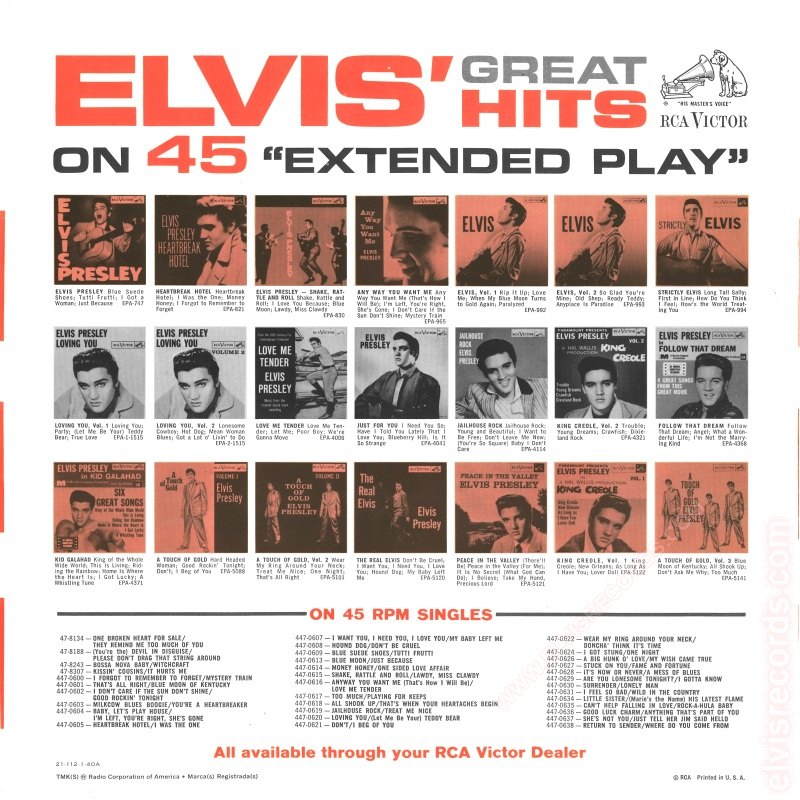 Number on sleeve: 21-112-1 40A (10/1964) Black, white, and red sleeve. 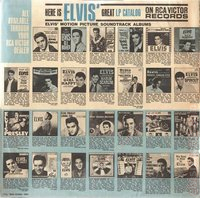 Front pictures Elvis LP catalog, most recent of which is "Kissin Cousins" (Side 1, Row 1, Column 6) Back shows RCA Elvis EP & 45 catalog. Number on sleeve: 21-112-1 40B (4/1965) Black, white, and red sleeve. 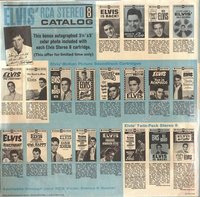 Front pictures Elvis LP catalog, most recent of which is "Roustabout" (Side 1, Row 1, Column 5) Back shows RCA Elvis EP & 45 catalog. 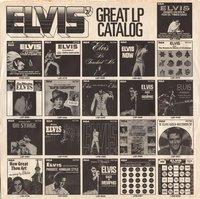 Number on sleeve: 21-112-1 40C (3/1967) Black, white, and blue sleeve. 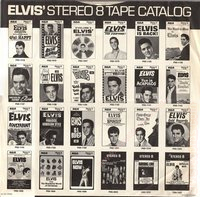 Front pictures Elvis LP catalog, most recent of which is "Spinout" (Side 1, Row 2, Column 2) Back shows RCA Elvis Stereo 8 catalog. 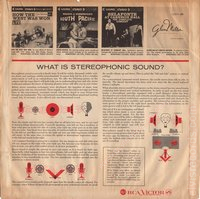 Number on sleeve: 21-112-1 40D (6/1968) Black, white, and red sleeve. 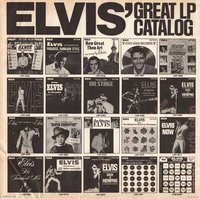 Front pictures Elvis LP catalog, most recent of which is "Golden Records Vol. 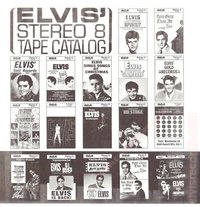 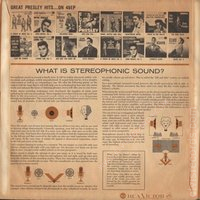 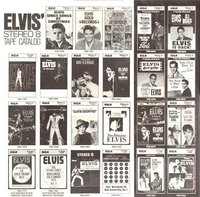 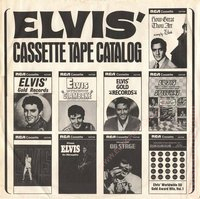 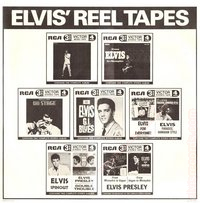 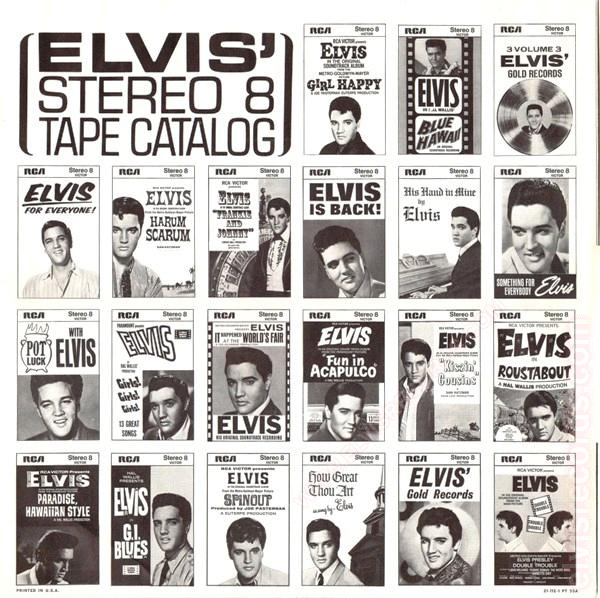 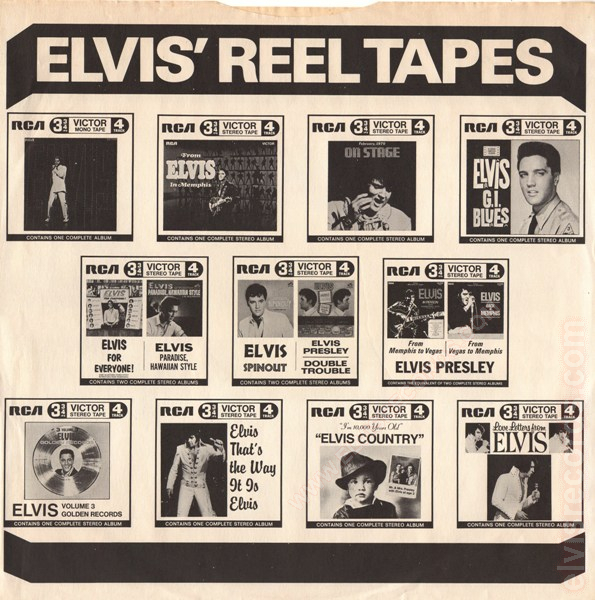 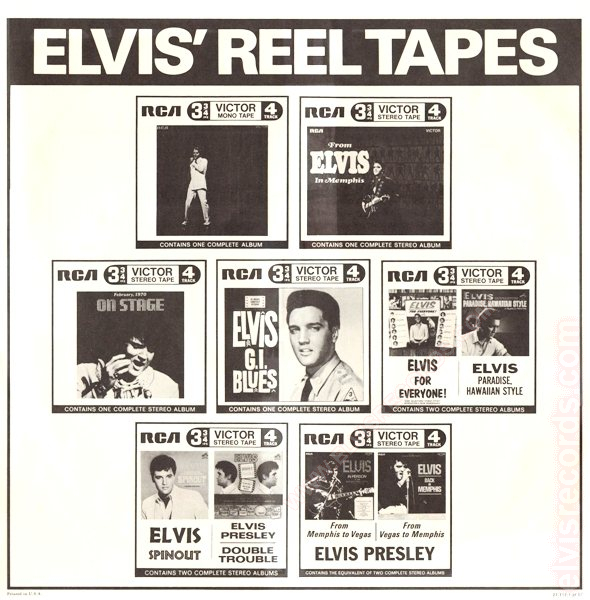 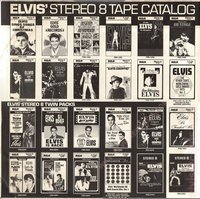 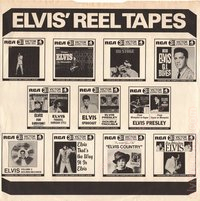 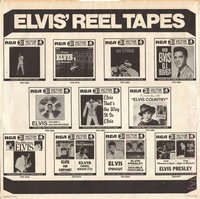 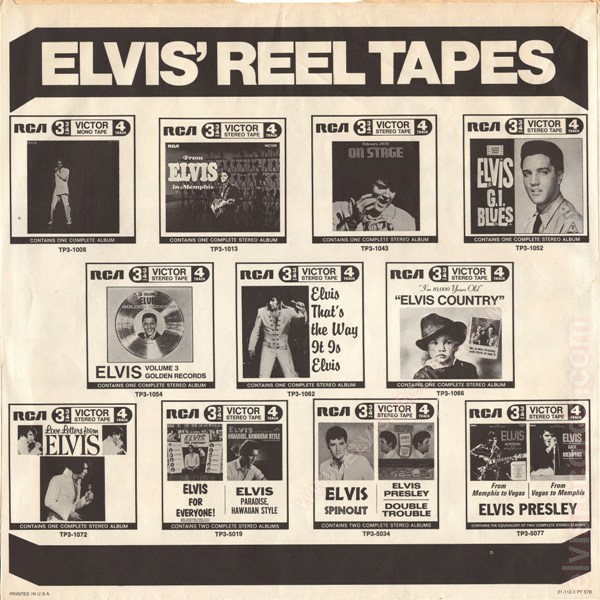 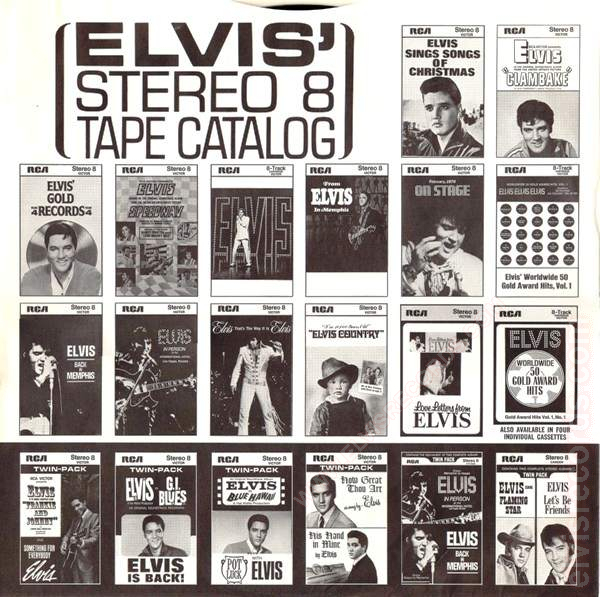 4" (Side 1, Row 4, Column 5) Back shows RCA Elvis LP, and Twin Pack Stereo 8 catalog. 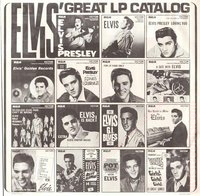 Number on sleeve: 21-112-1 pt 57 (8/1970) Black & white sleeve. 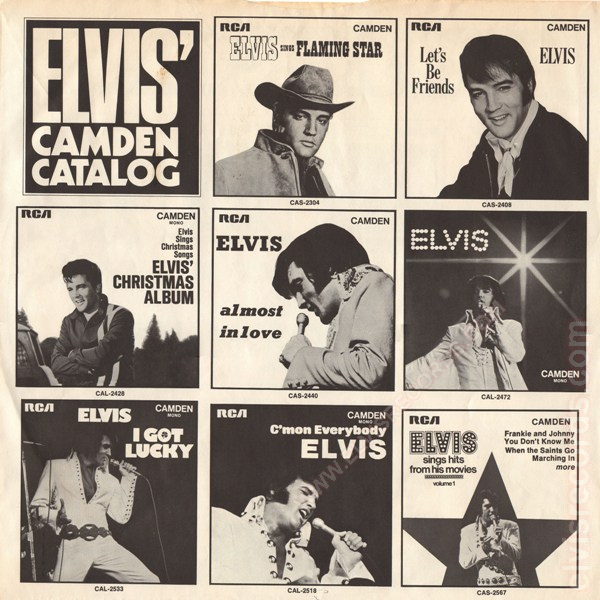 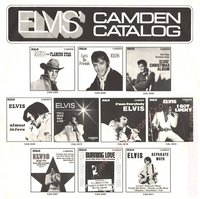 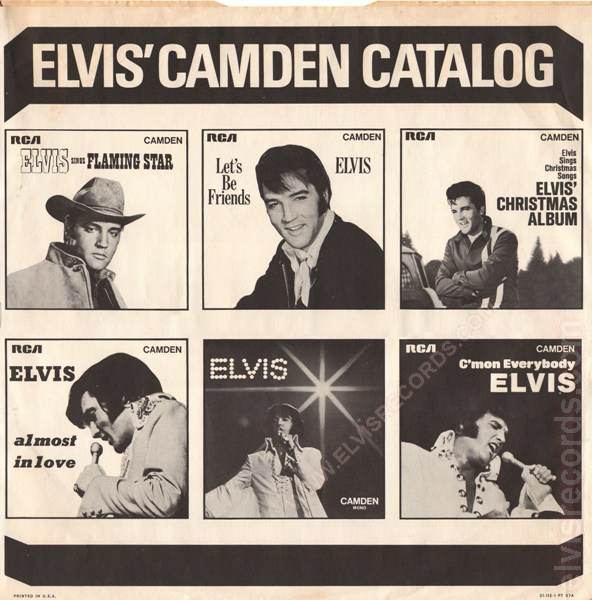 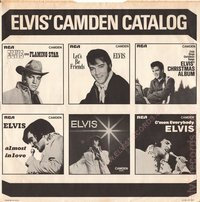 Front pictures Elvis CAMDEN catalog, most recent of which is "Elvis Christmas Album" (Side 1, Row 2, Column 1) Back pictures RCA 3-ips reel tapes. 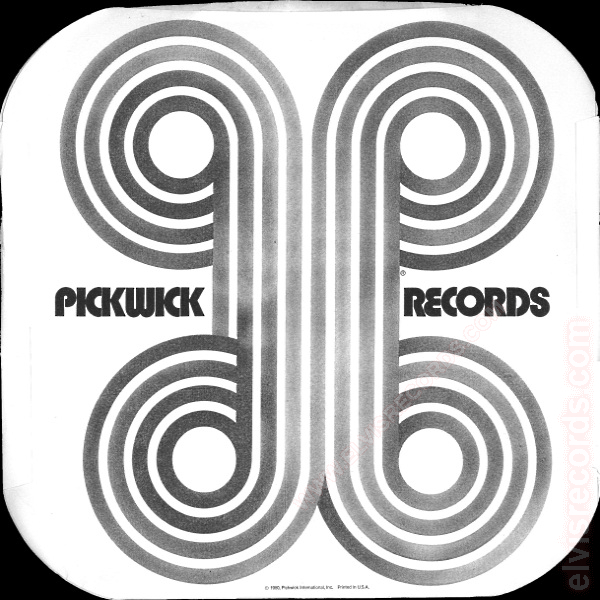 Number on sleeve: 21-112-1 pt 57D (11/1973) Black & white sleeve. 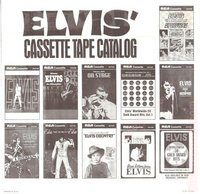 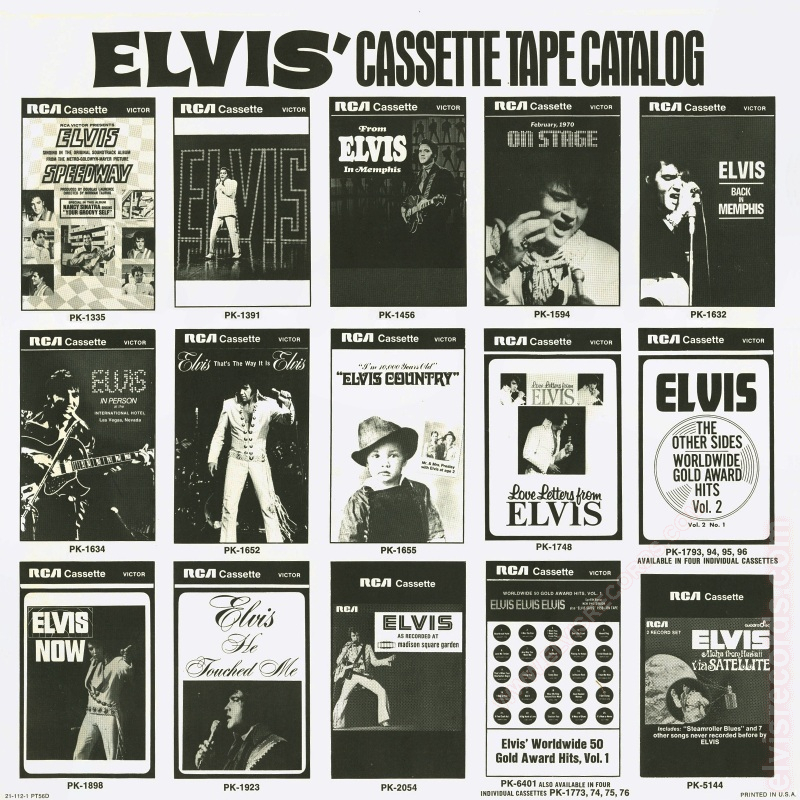 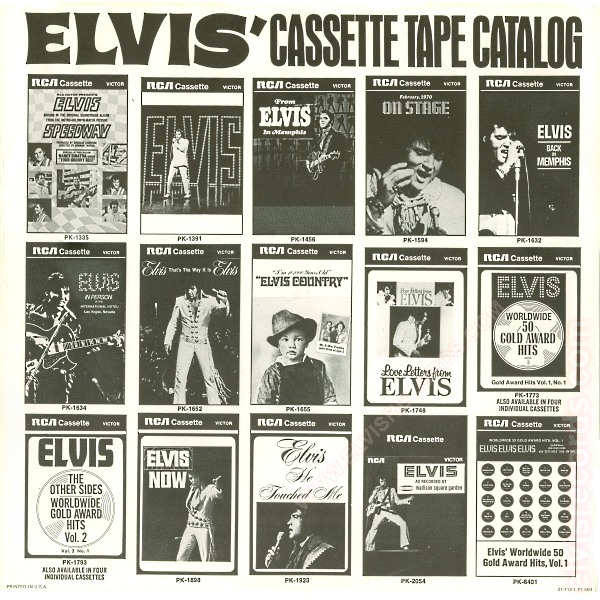 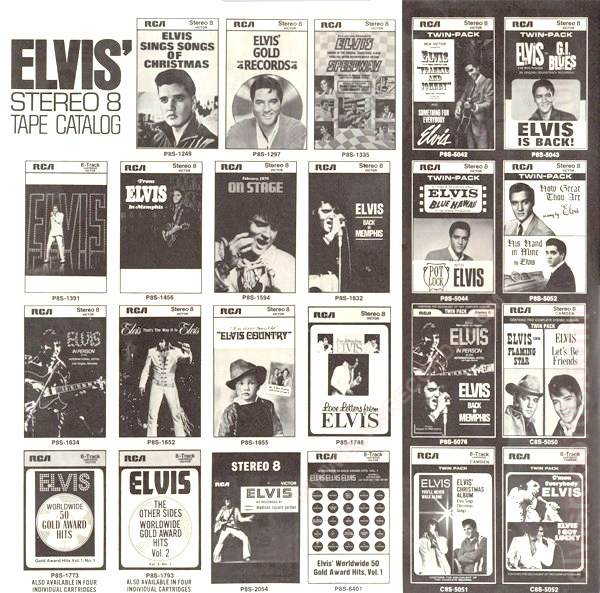 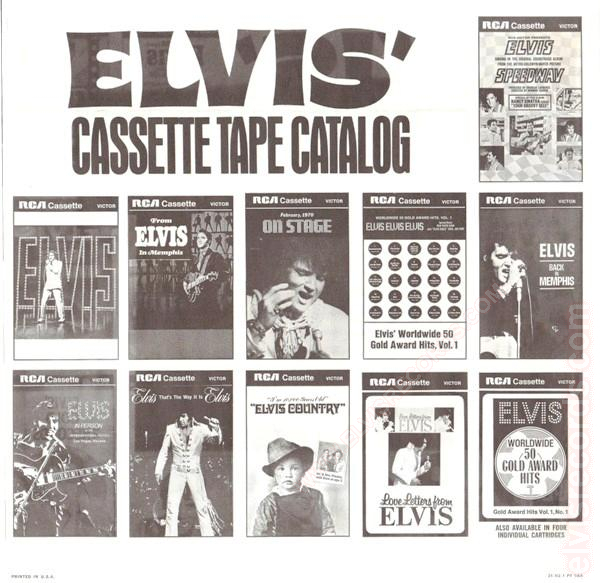 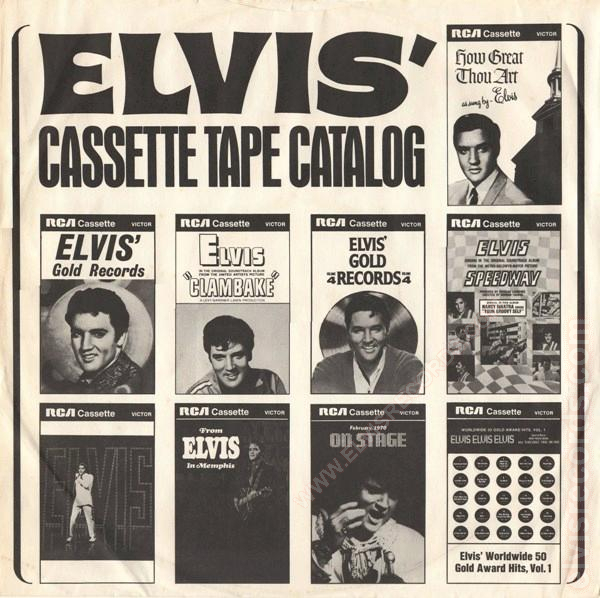 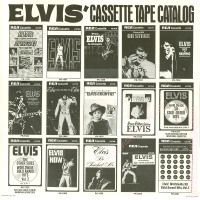 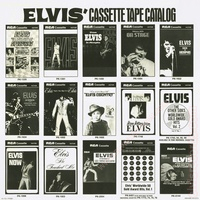 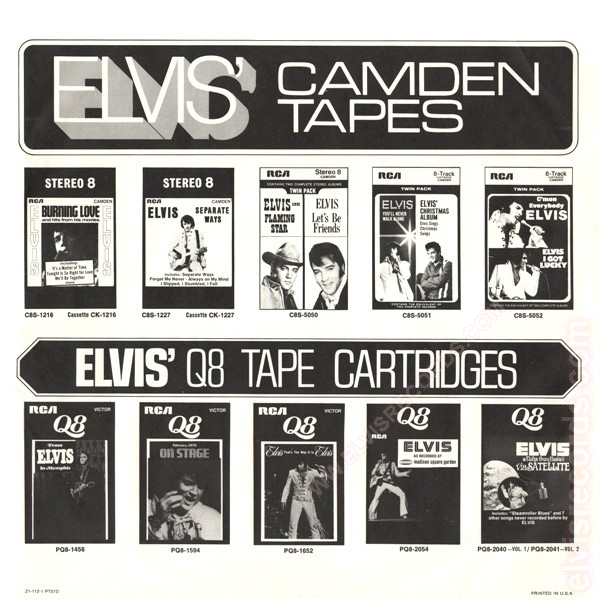 Front pictures Elvis CAMDEN tapes and Q8 Tape catalog, the most recent of which is "Aloha from Hawaii via satellite" (Side 1, Row 2, Column 5) Back pictures CAMDEN LP catalog. Blue & white sleeve. 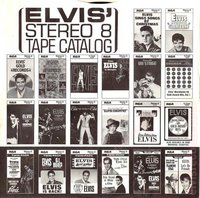 (1975?) 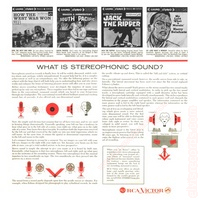 On both sides. 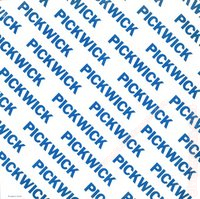 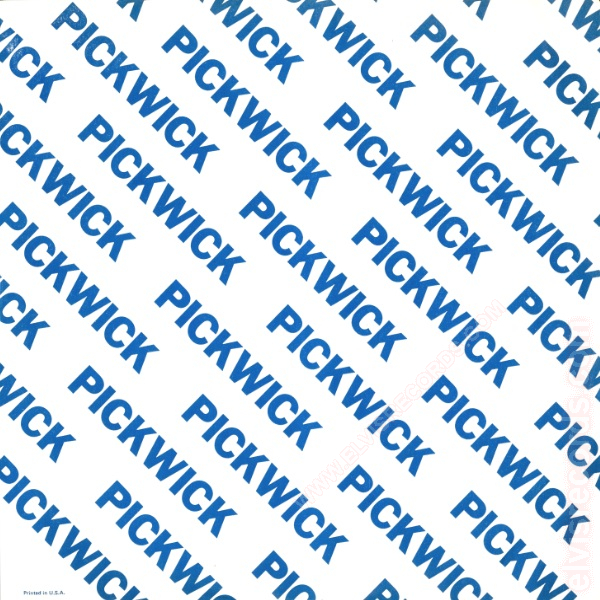 Pickwick repeated in blue lettering in a 45 degree angle evenly spaced until the inner sleeve is completely covered. 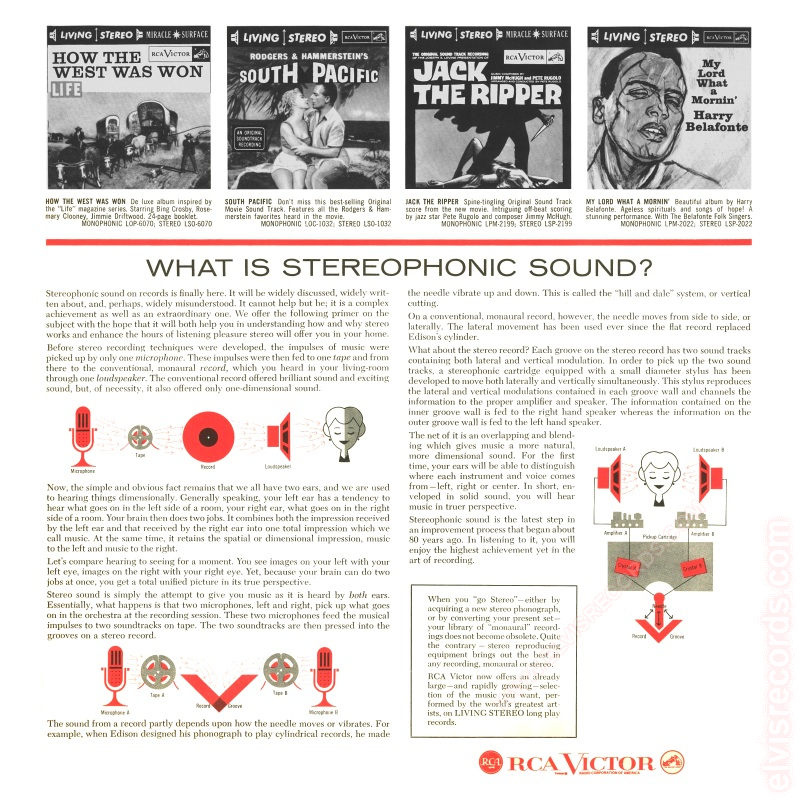 Printed in U.S.A. lower left corner. 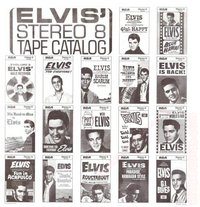 Black & white sleeve. 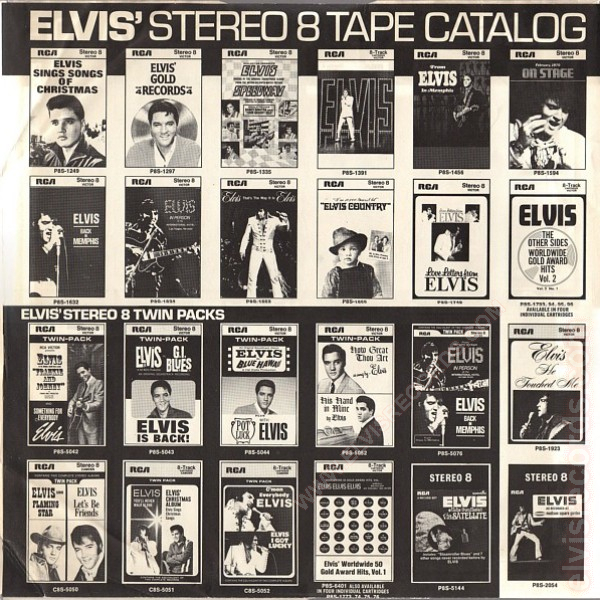 (1980) On both sides. 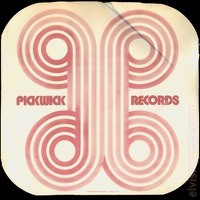 Pickwick records separated by four interlocking Pickwick logos. 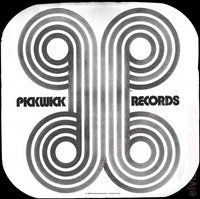 (c) 1980 Pickwick International, Inc. 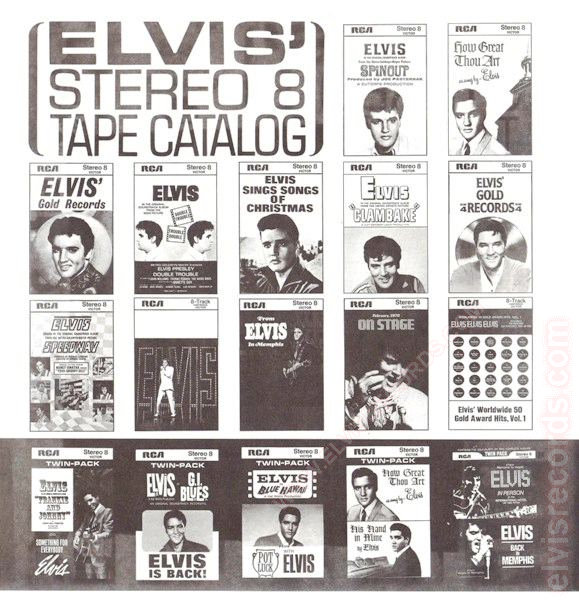 Printed in U.S.A.bottom center. 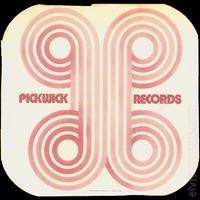 Maroon & white sleeve. 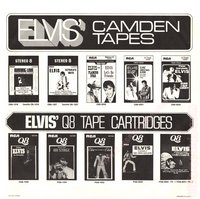 (1980) On both sides. 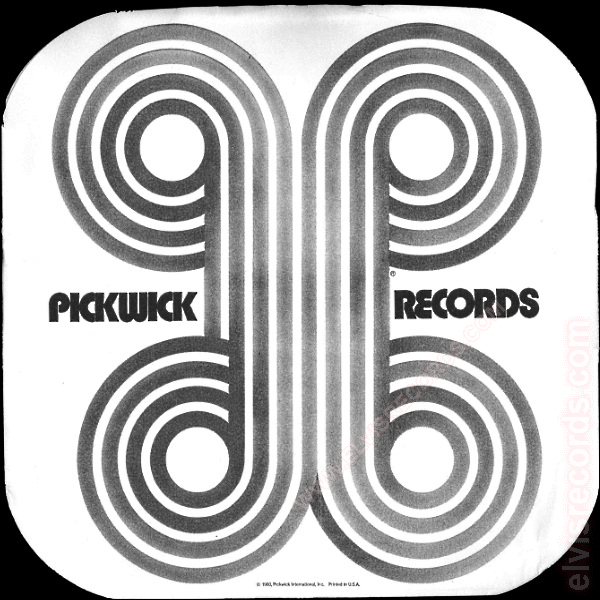 Pickwick records separated by four interlocking Pickwick logos. 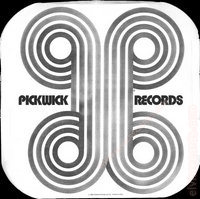 (c) 1980 Pickwick International, Inc. 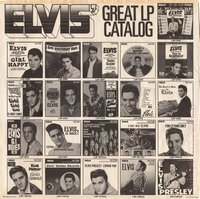 Printed in U.S.A.bottom center.